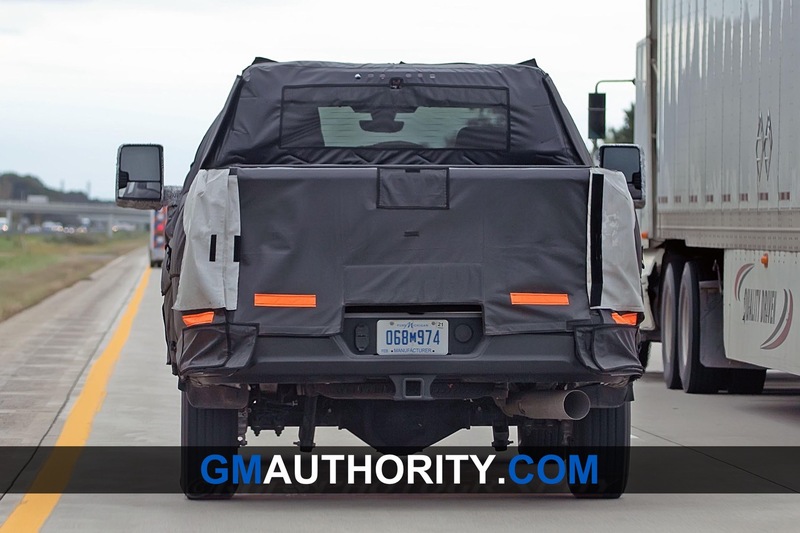 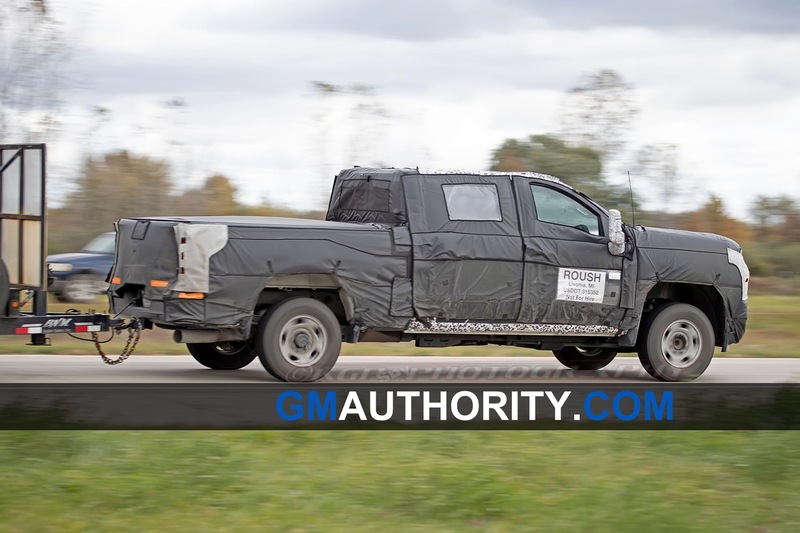 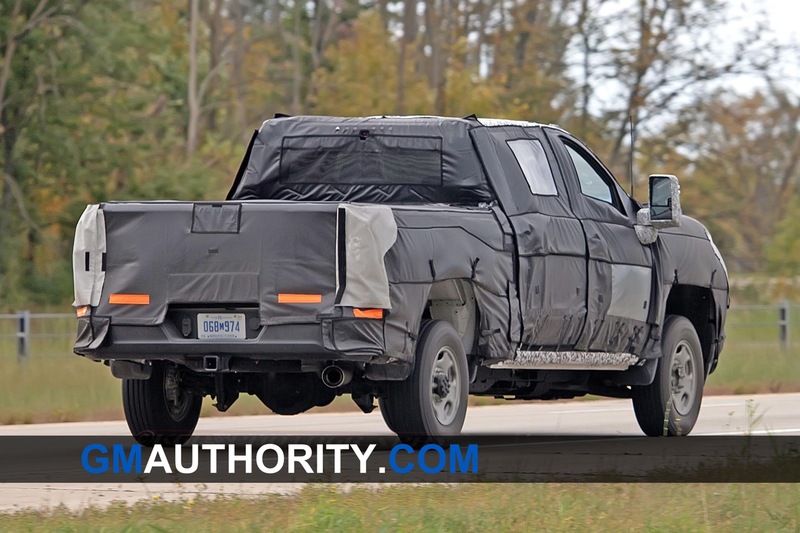 We’ve already seen Chevy’s upcoming 2020 Silverado HD undergoing testing on multiple occasions, but today we have our best look yet at the upcoming big rig, which just dropped its bulky vinyl camo in favor of a tight graphic wrap. 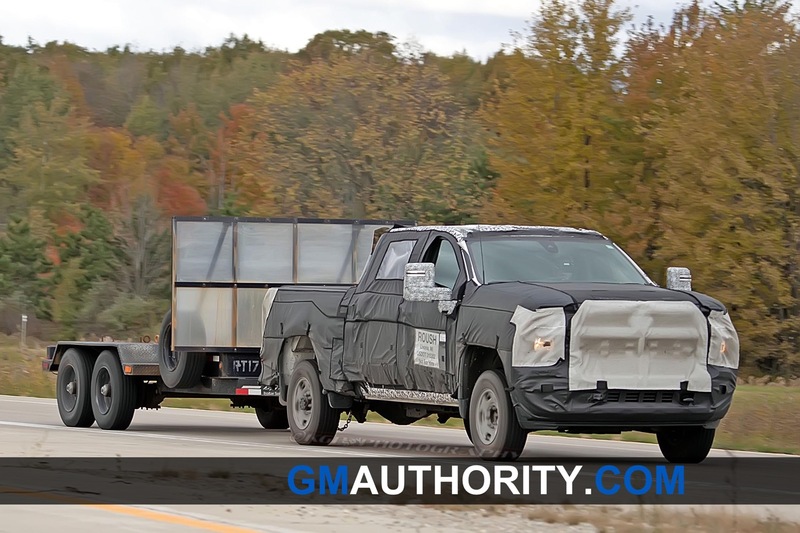 This final testing phase reveals much more about the new heavy duty trucks. 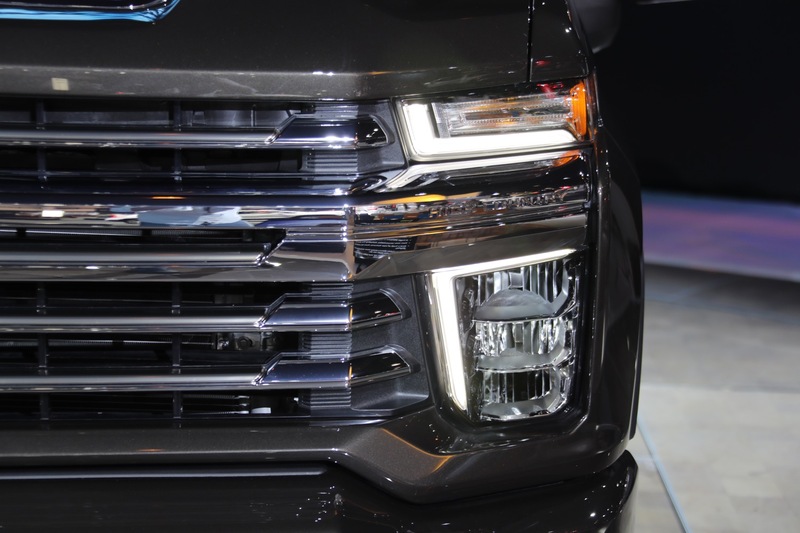 Up front, we get our best look yet at the new headlight design and LED signature. 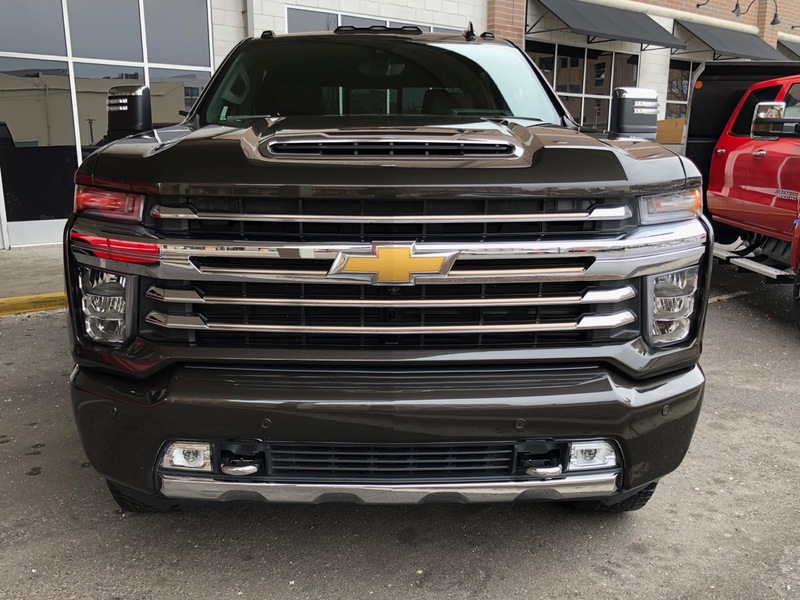 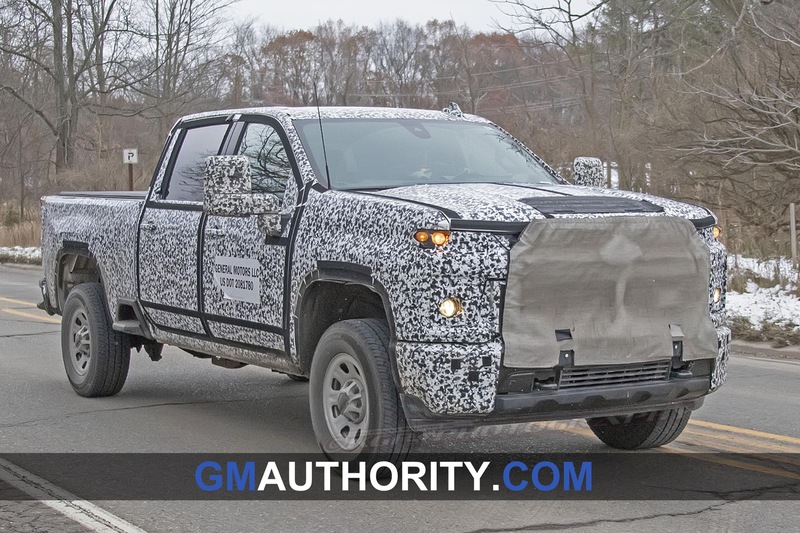 As the photo below shows, the headlights of the 2020 Silverado HD will be comprised of two levels, both with corresponding vertical and horizontal strips. 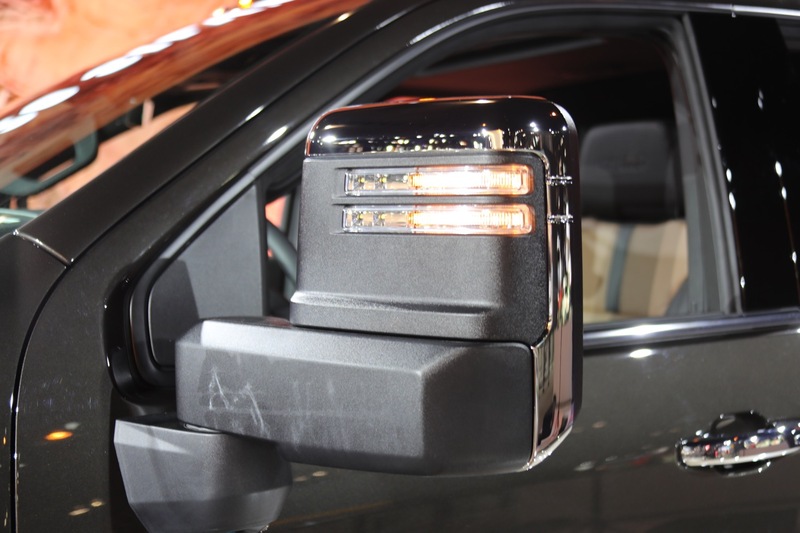 We also see (for the first time) an amber turn signal activated on the driver’s side of the truck. 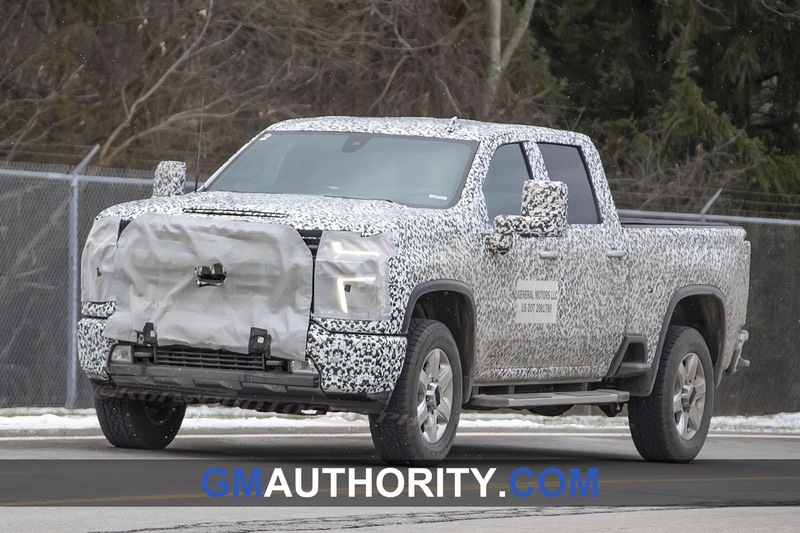 Meanwhile, the pictures also reveal an air intake on the hood that seems to be an evolution of the intake introduced on the 2017 Silverado HD. 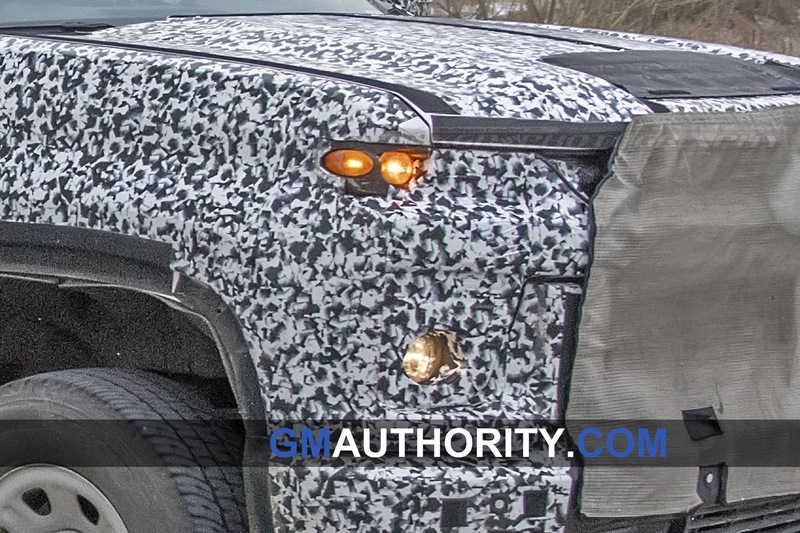 Elements of the grille are also peaking through the camo, which continues to obfuscate the final design. 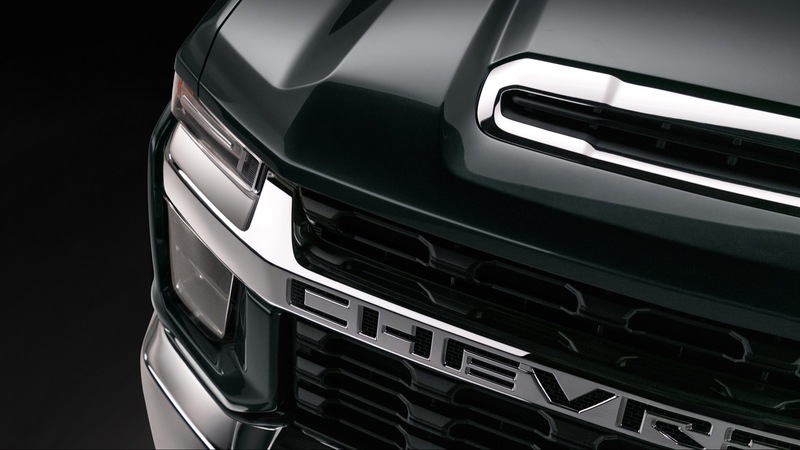 Even so, we have a pretty good idea of how the front end will look thanks to the teaser image Chevy shared earlier this year. 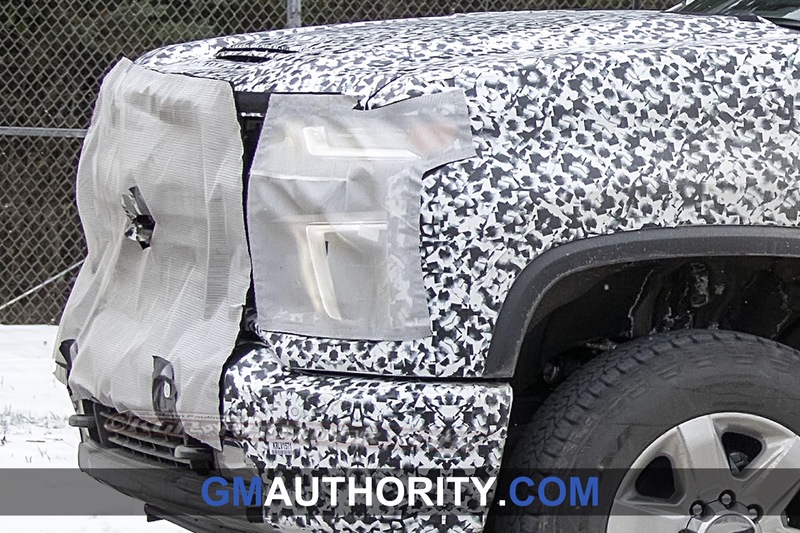 At least some models will feature a rather expressive, lettered Chevrolet grille. 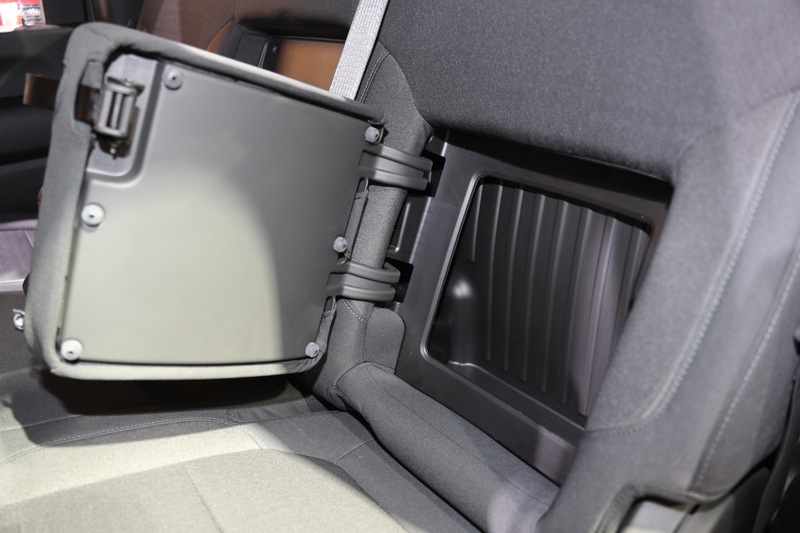 We also see another feature – a new side step integrated into the box just ahead of the rear wheels, which should make it easer to access the bed from the side of the truck. 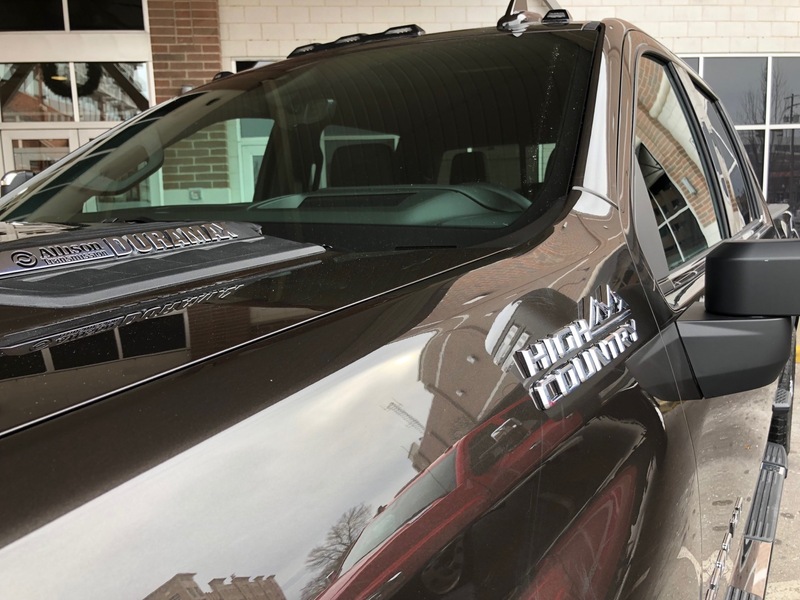 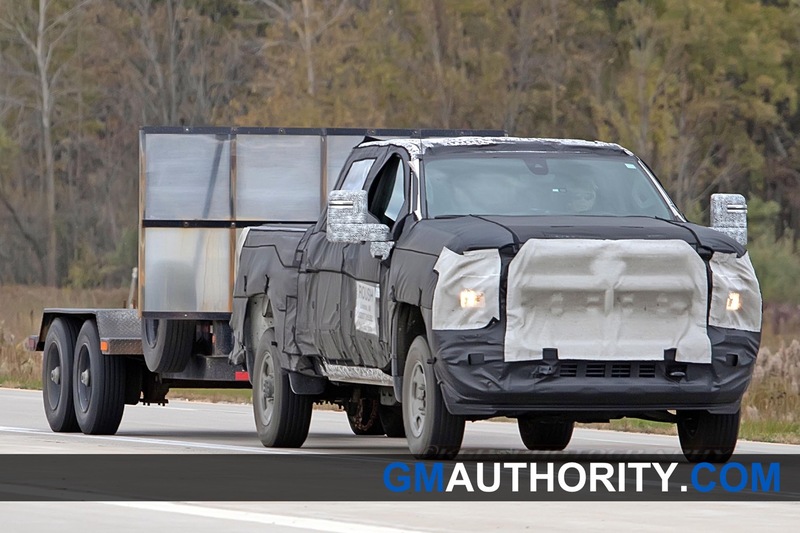 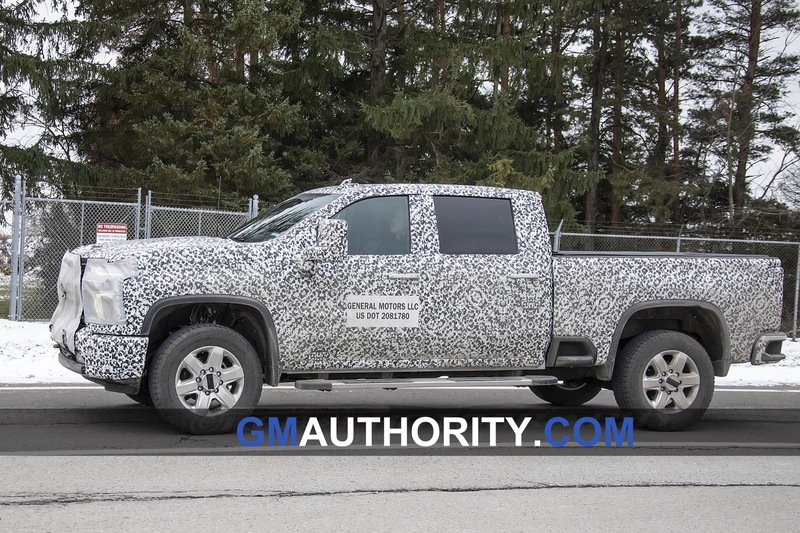 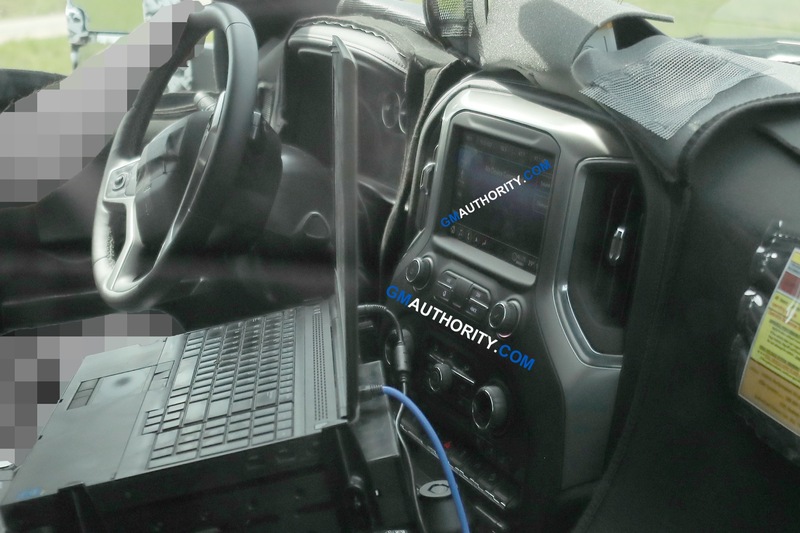 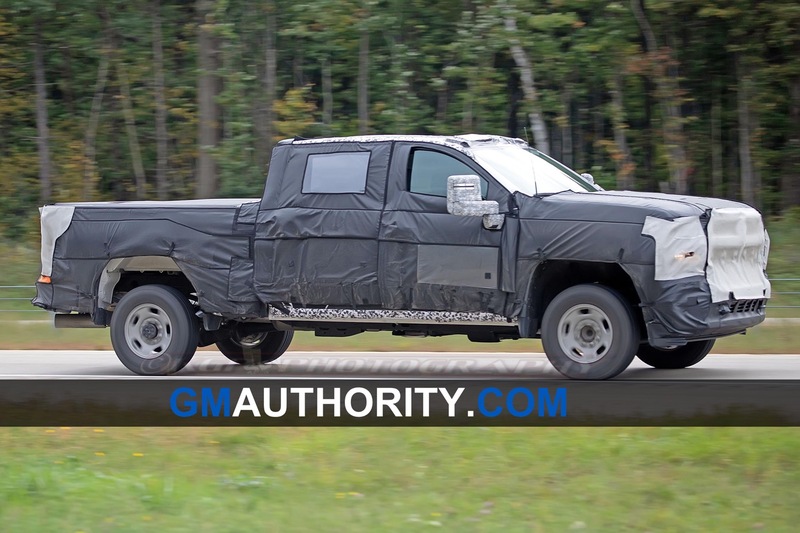 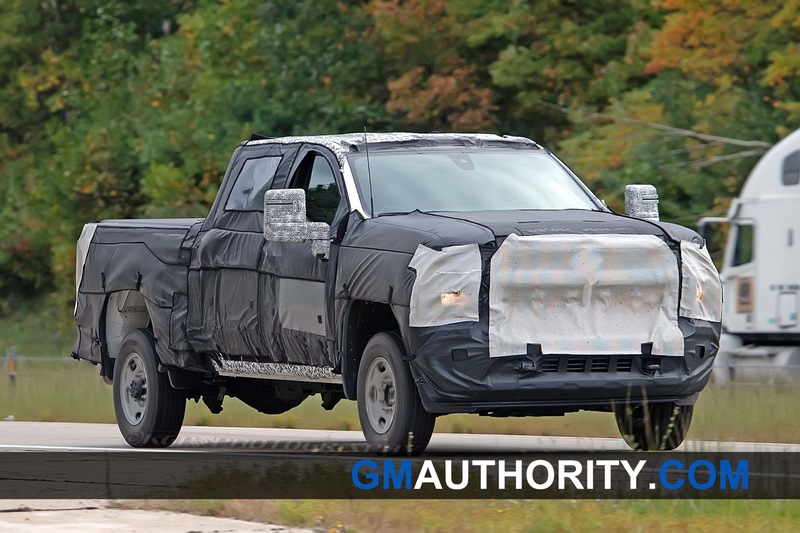 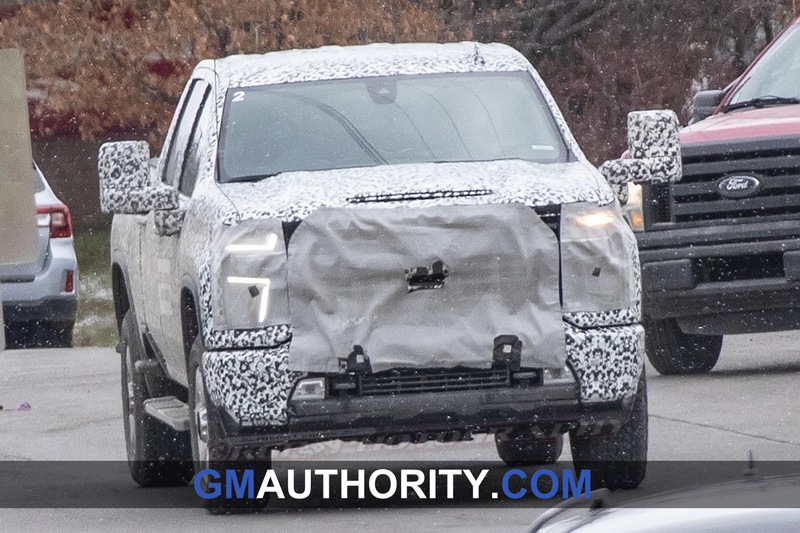 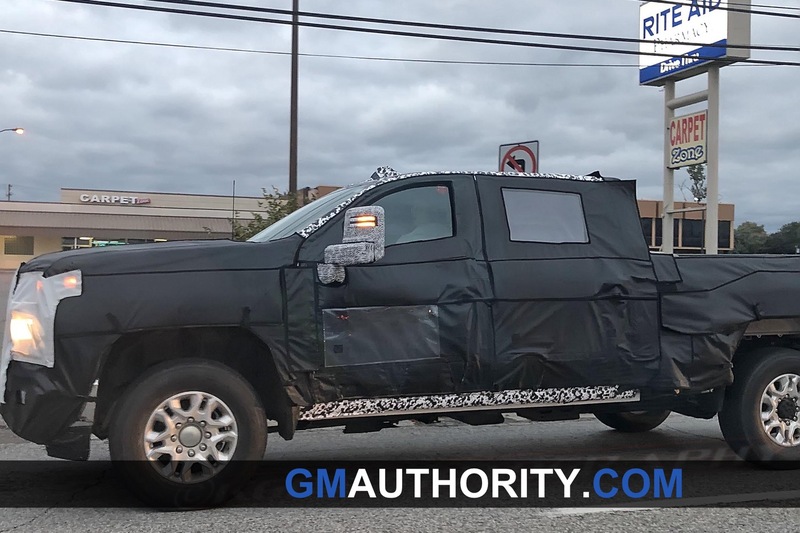 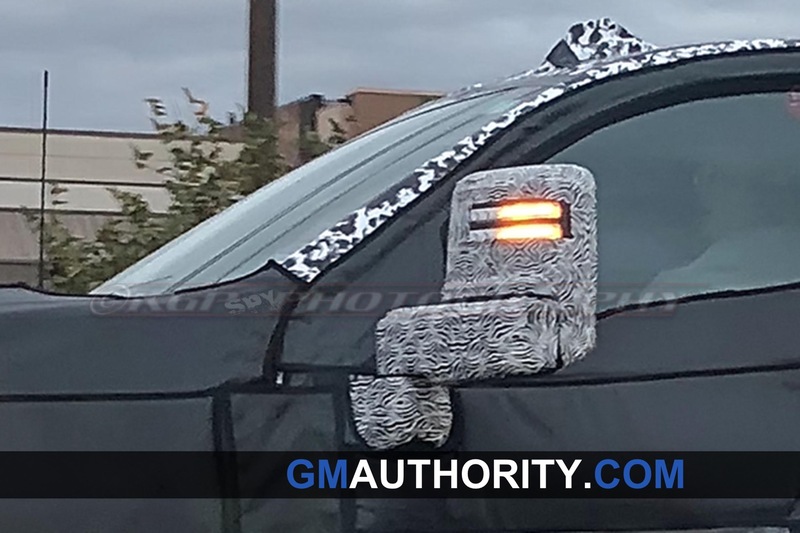 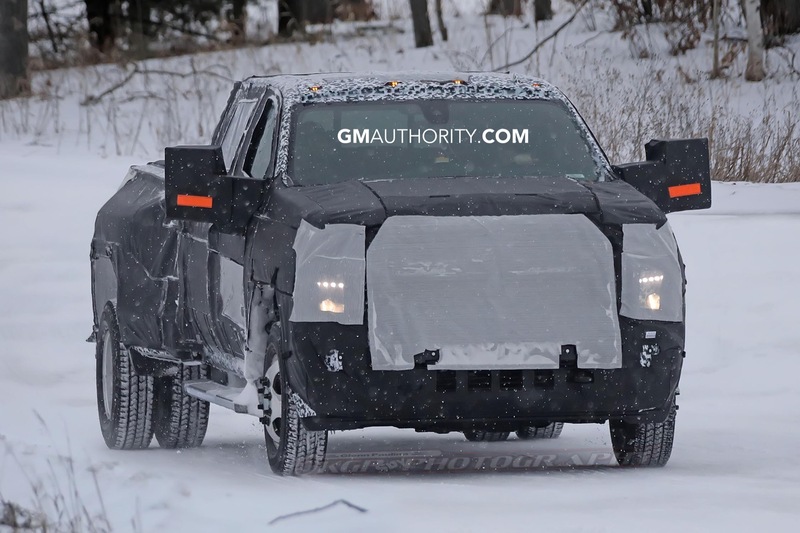 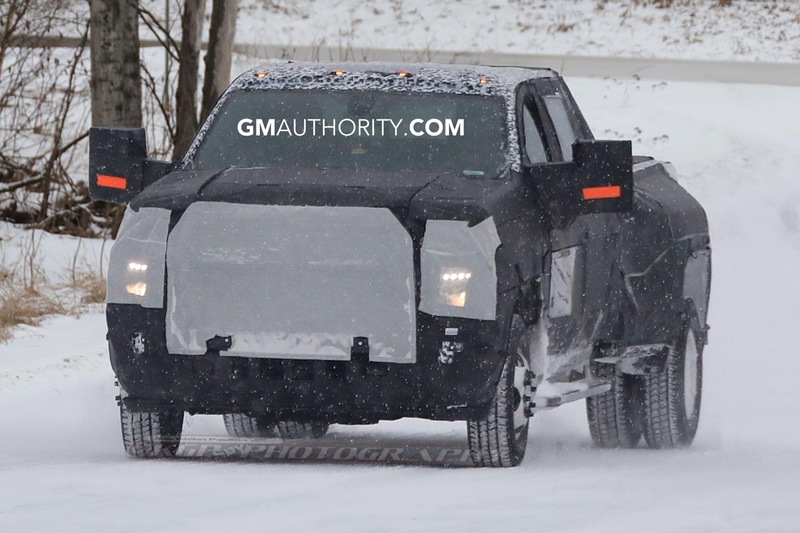 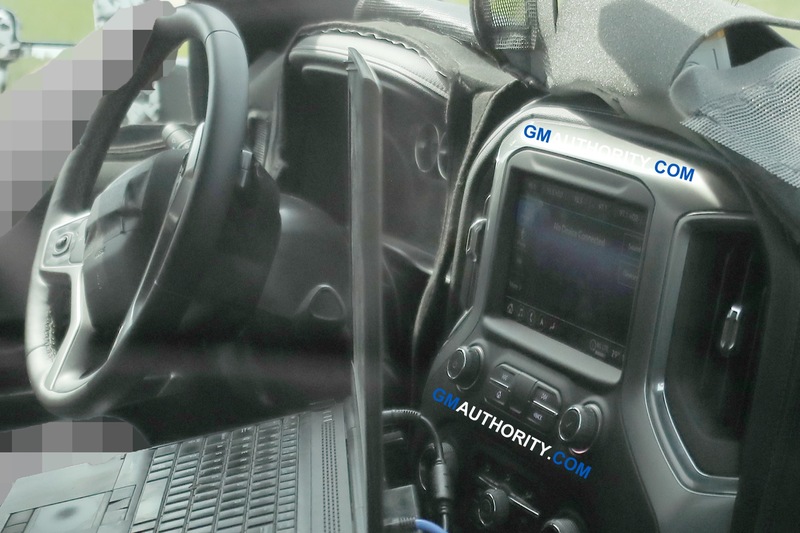 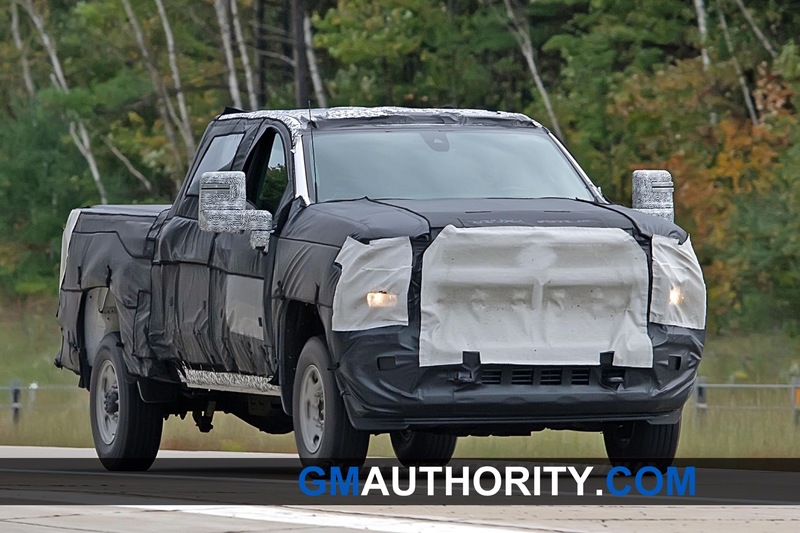 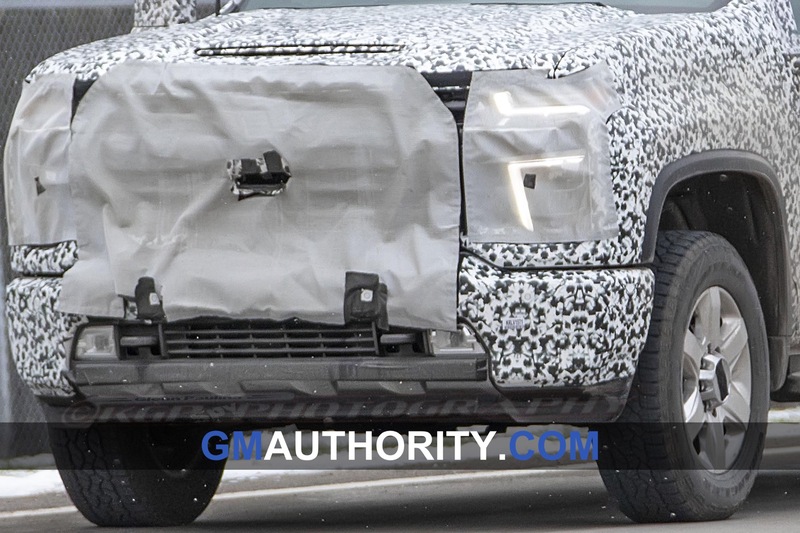 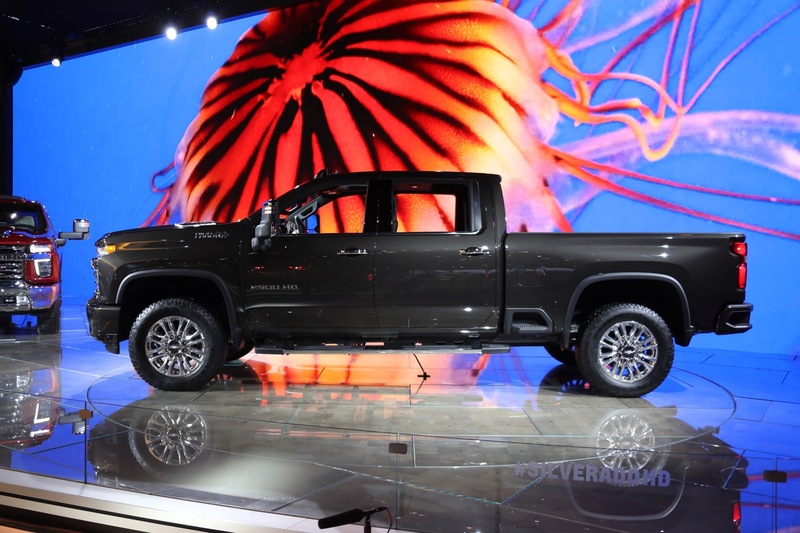 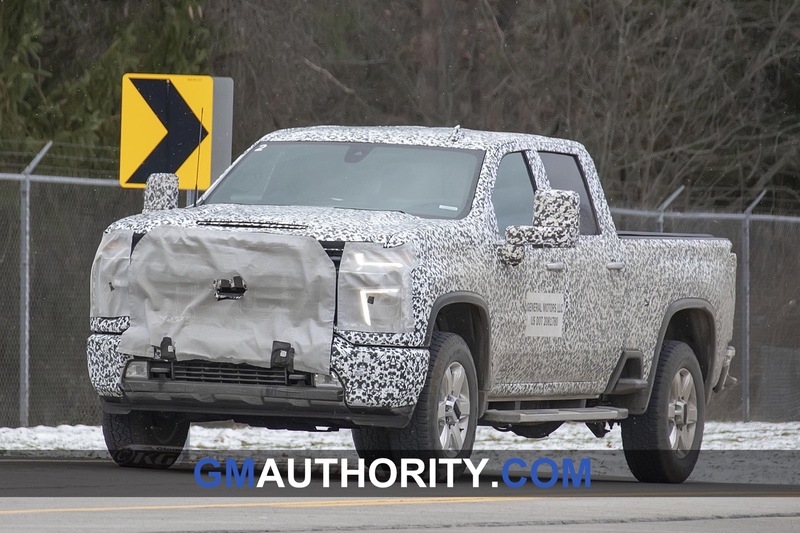 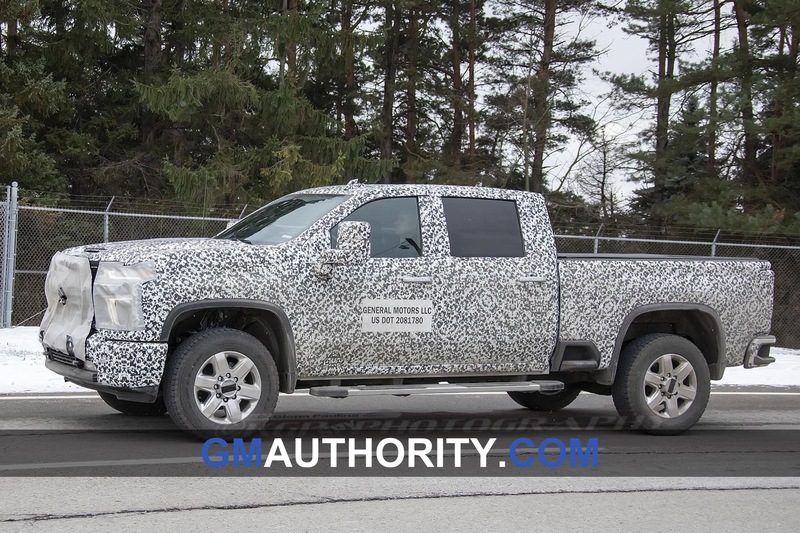 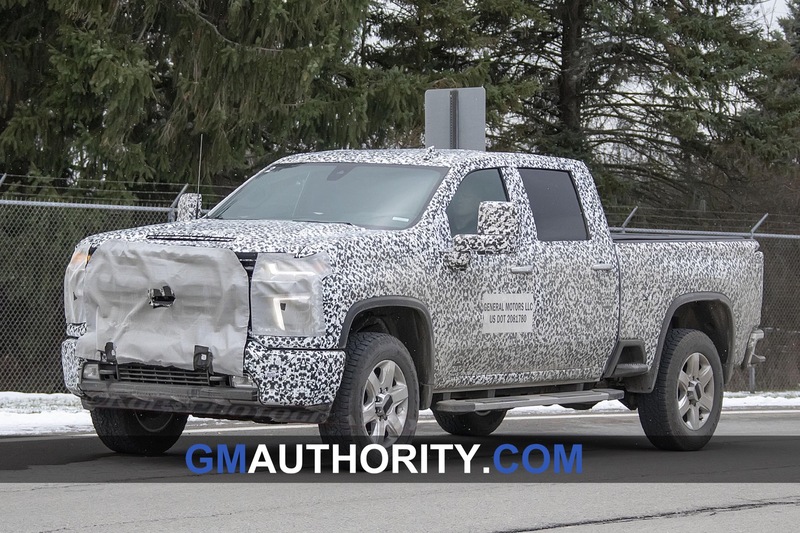 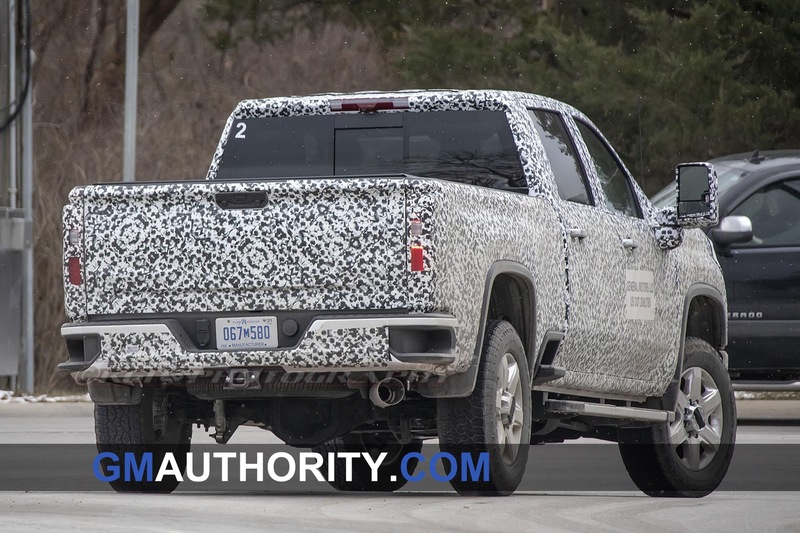 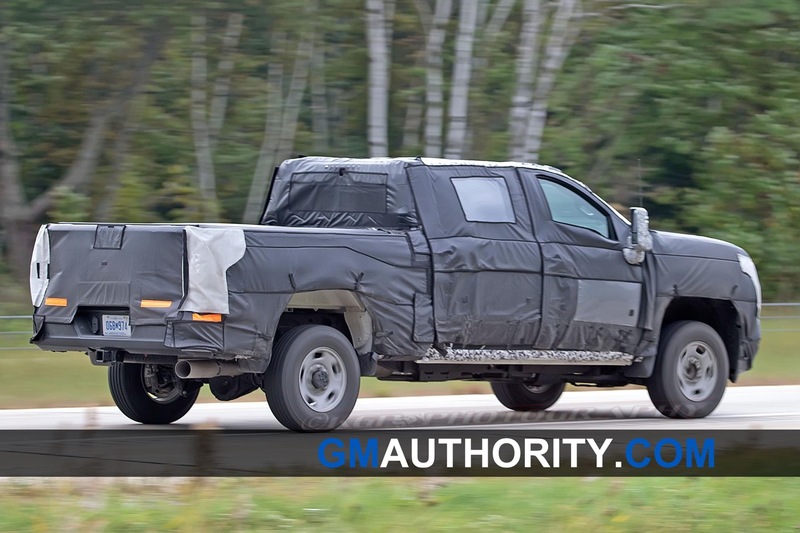 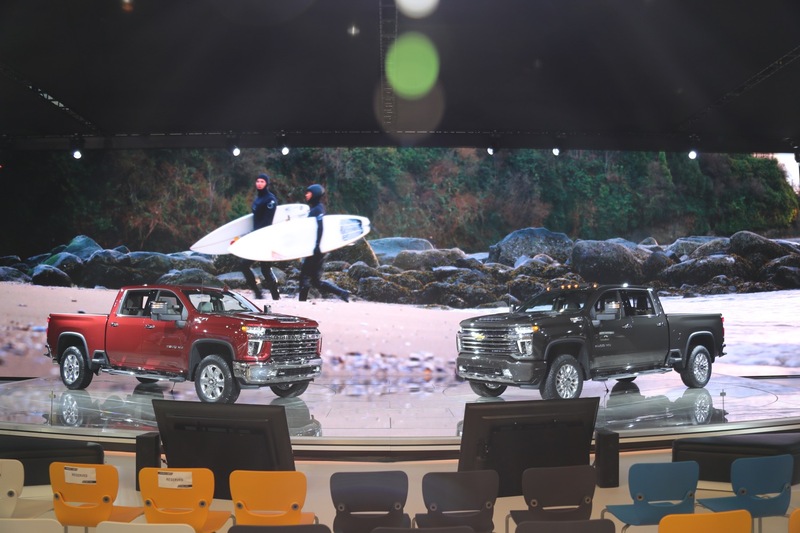 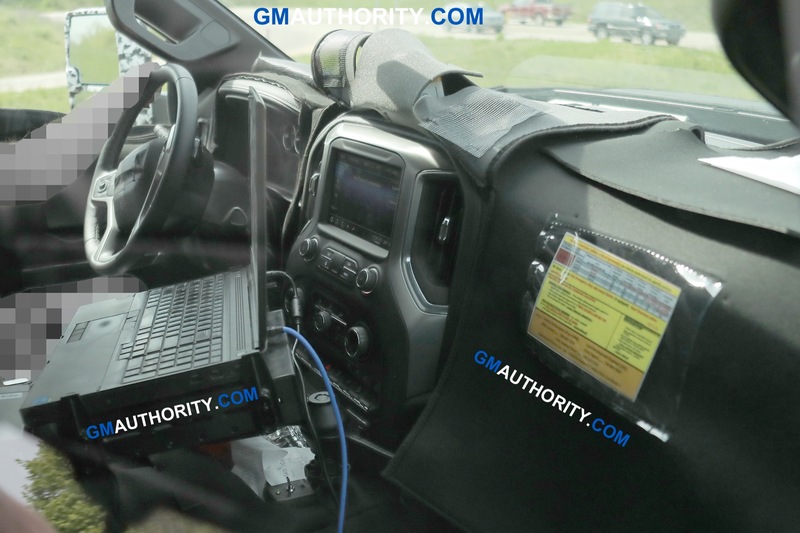 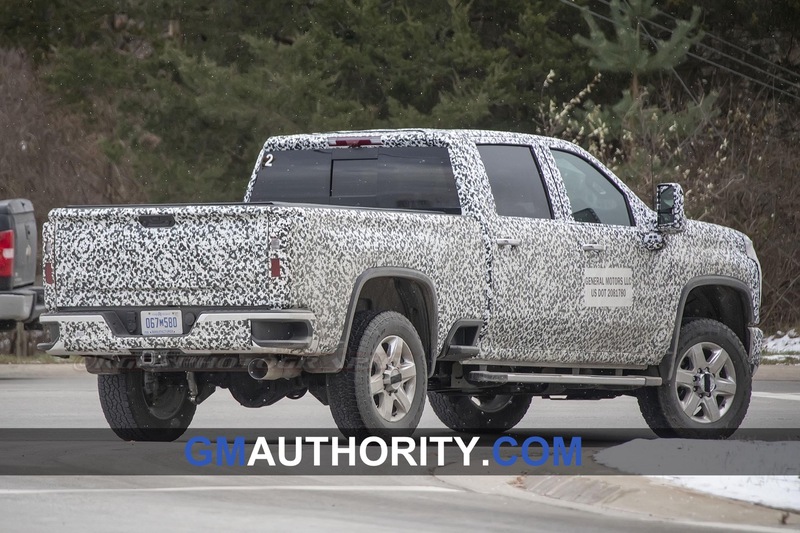 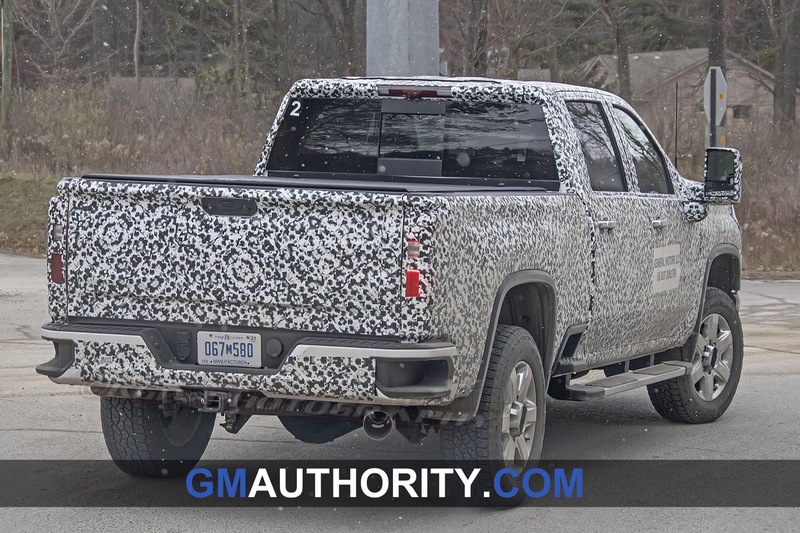 GM Authority was first to spot this feature months ago, even when the 2020 Silverado HD prototypes were clad in heavy vinyl camo. 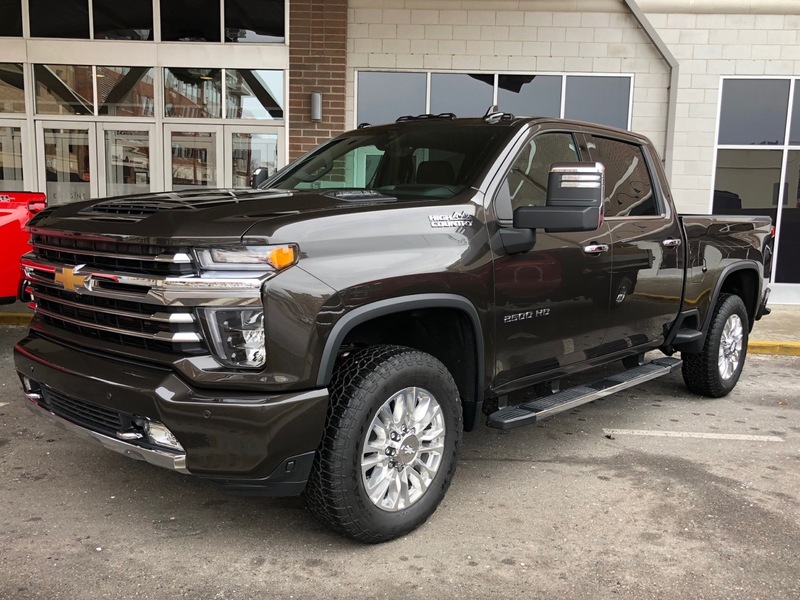 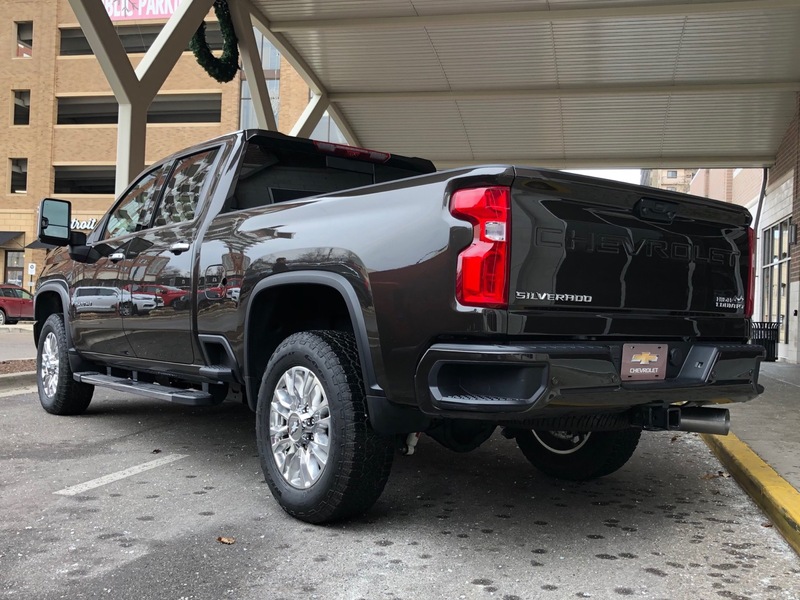 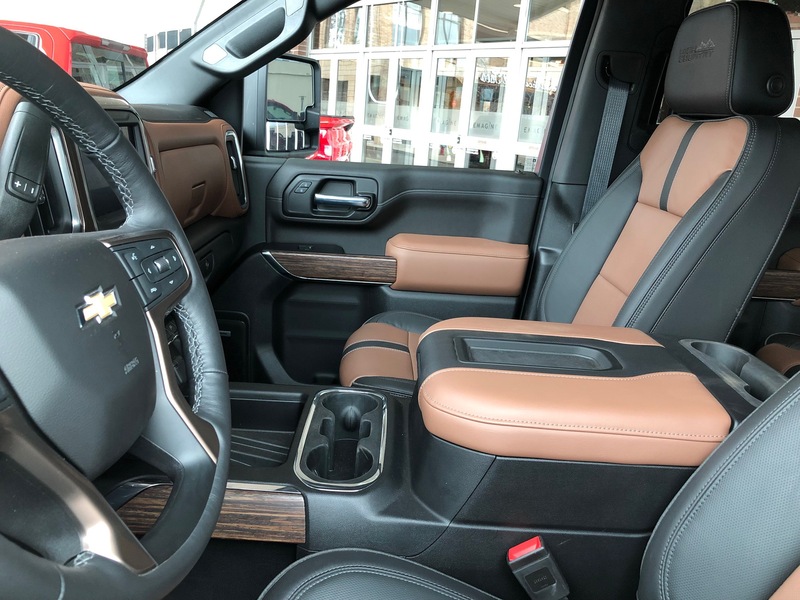 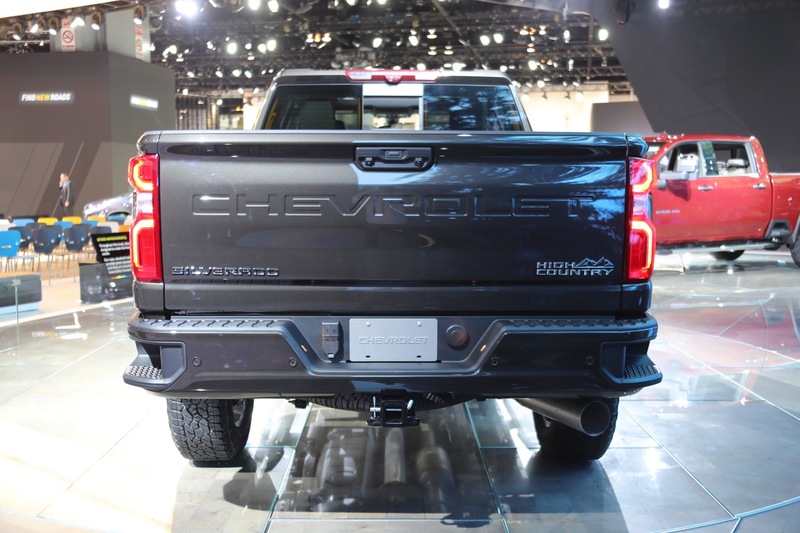 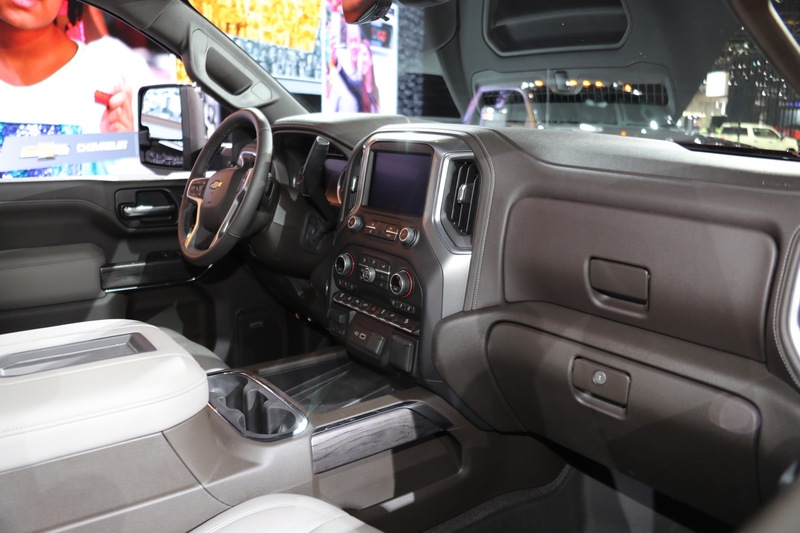 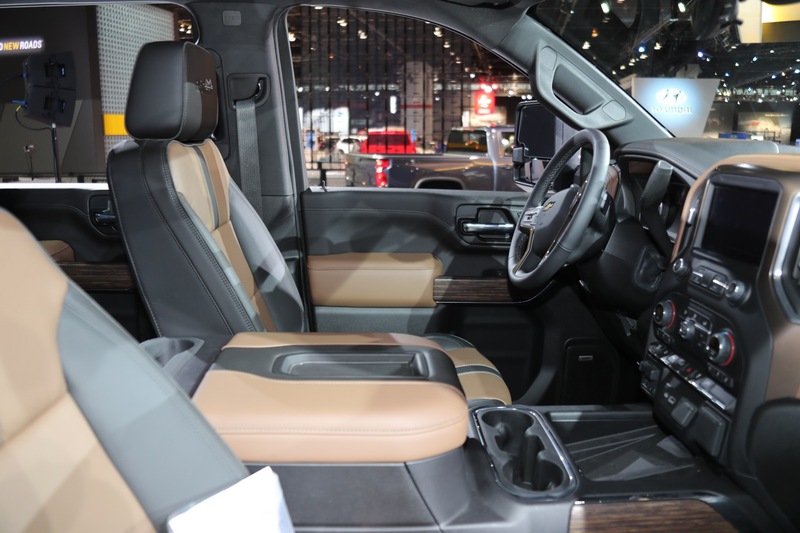 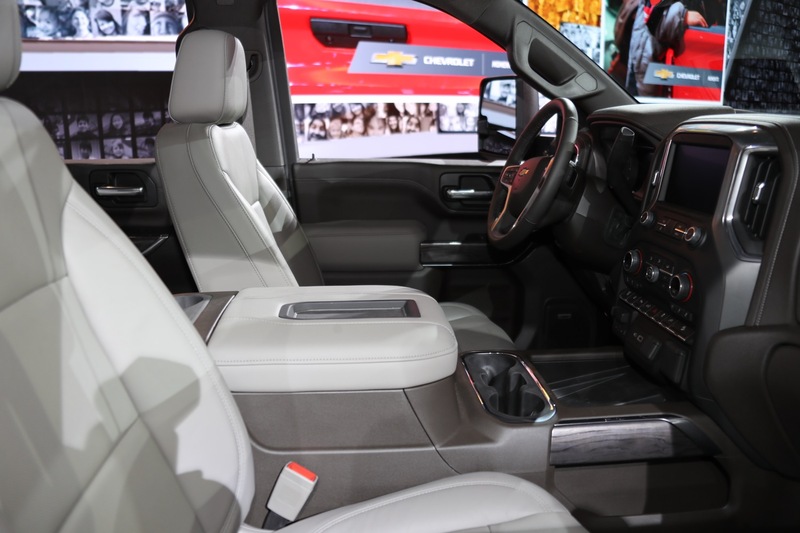 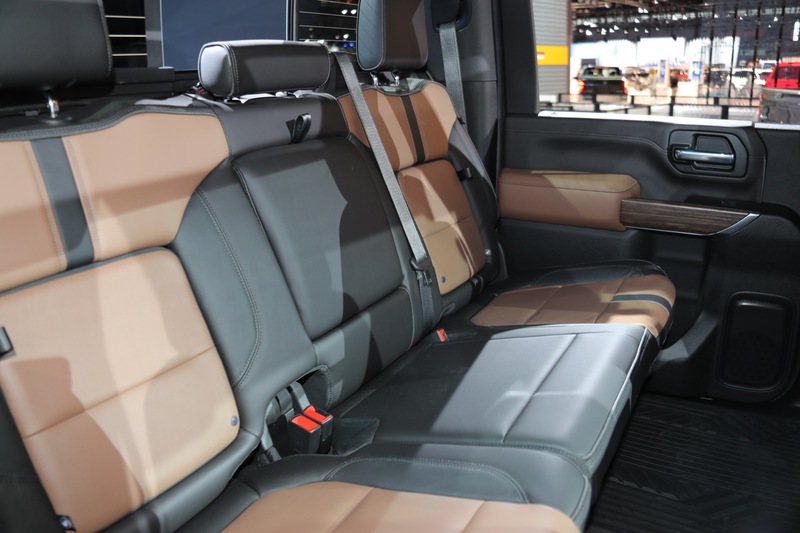 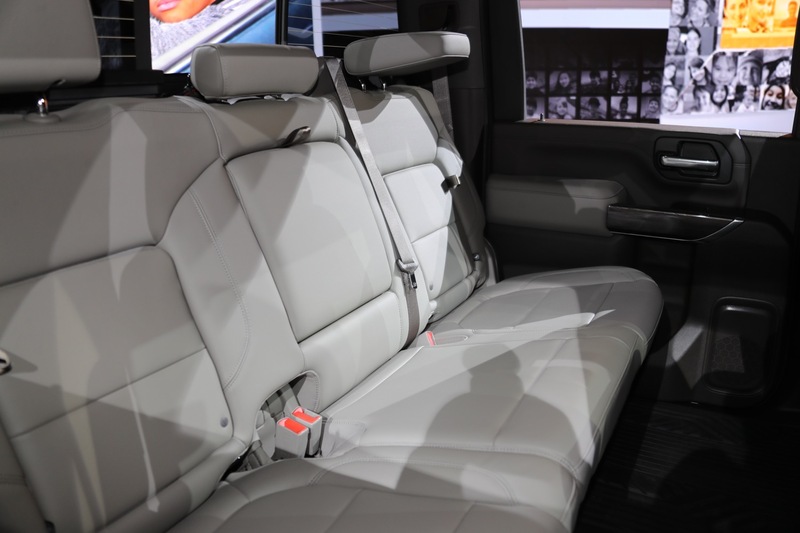 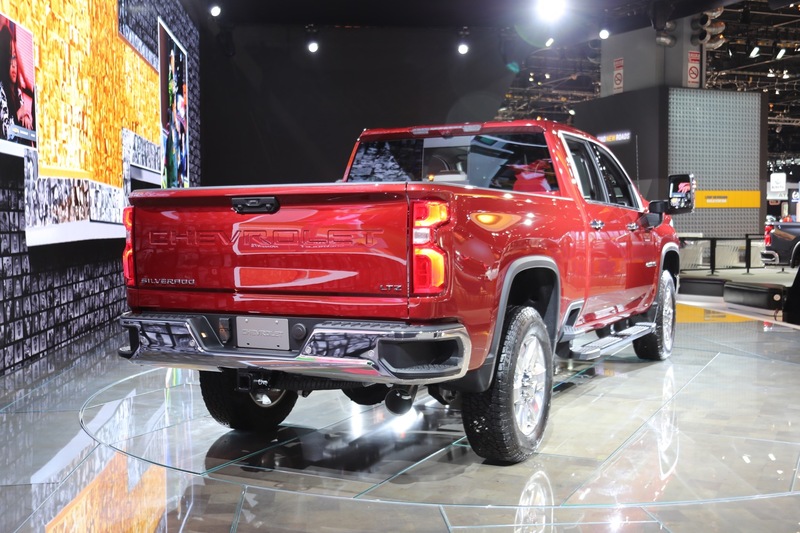 With steps integrated into the rear end as part of the CornerStep rear bumper feature and the class-exclusive side access step, the 2020 Silverado HD will have quite an accessible bed. 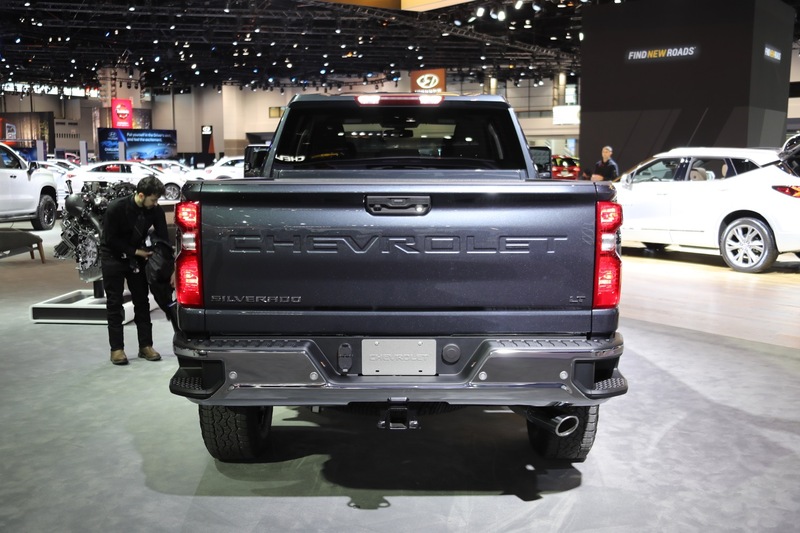 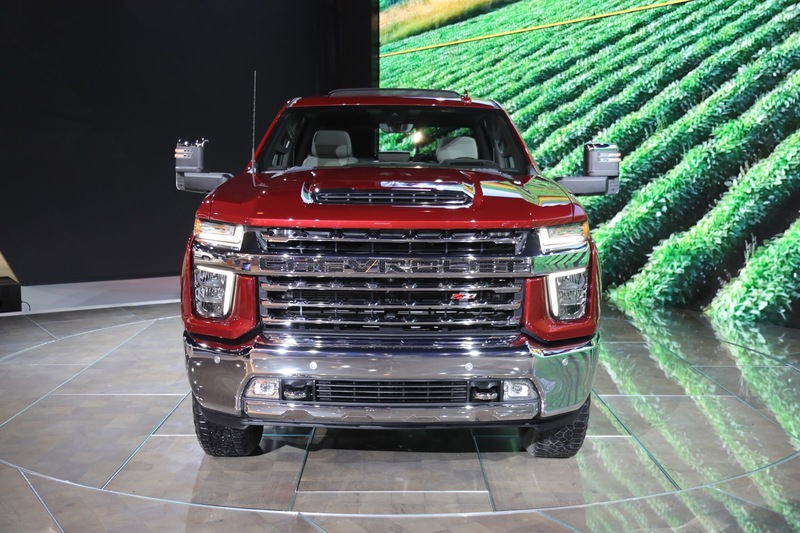 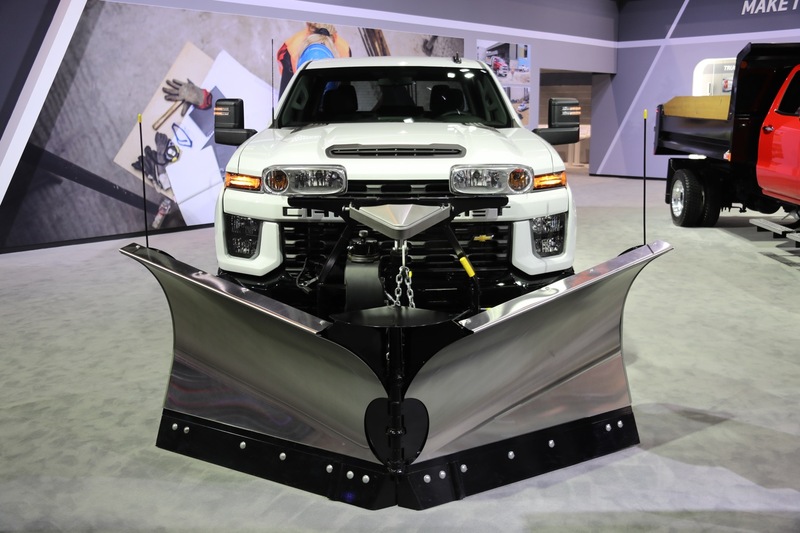 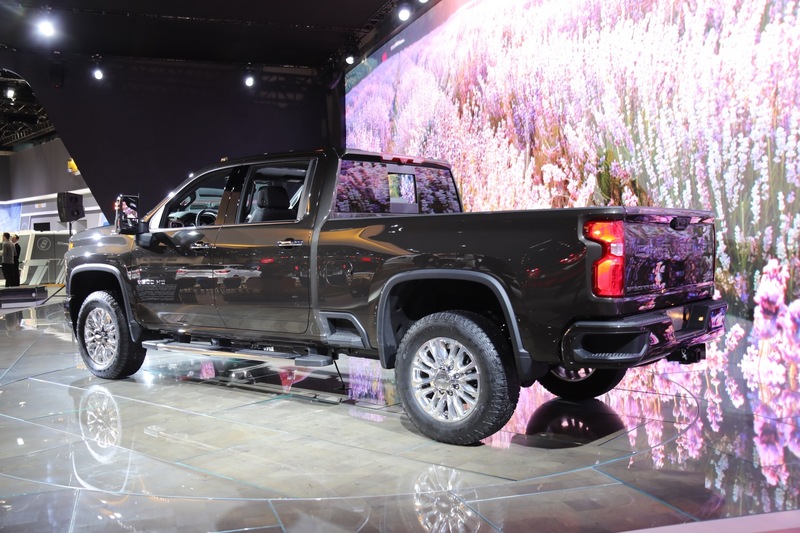 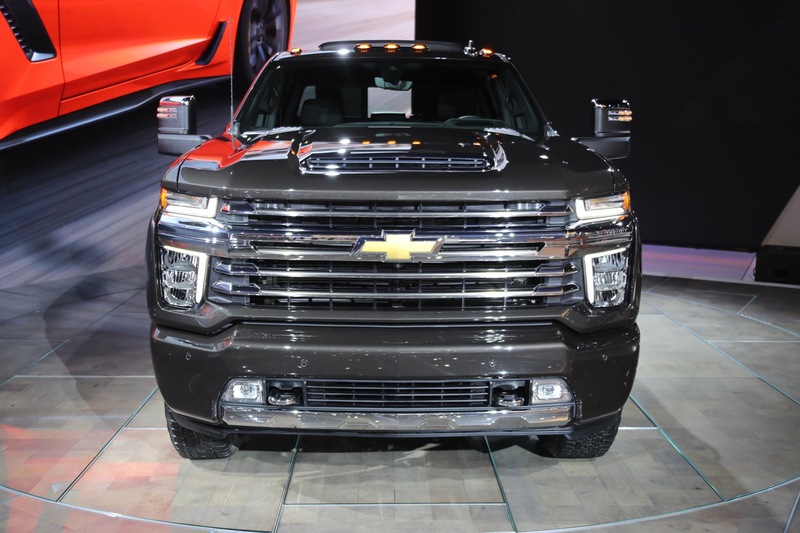 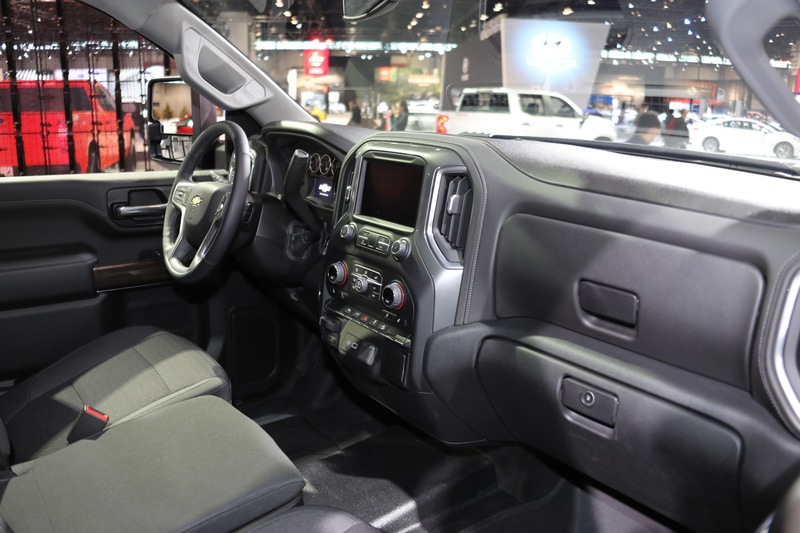 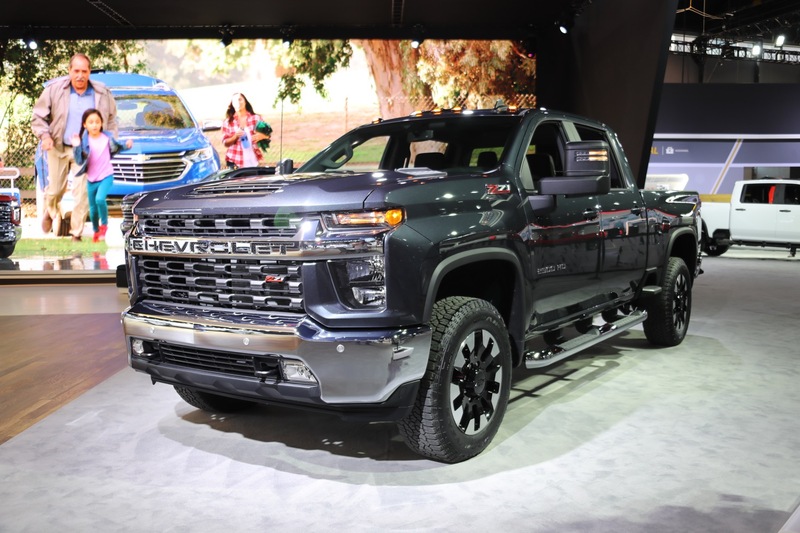 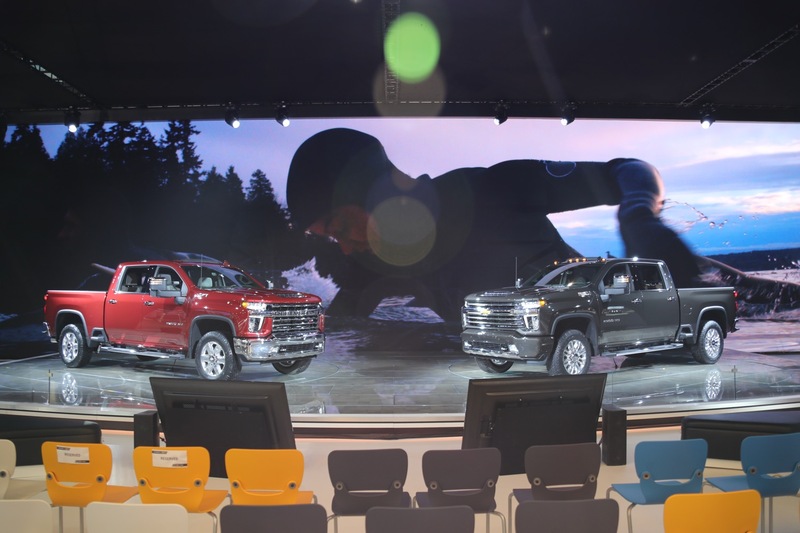 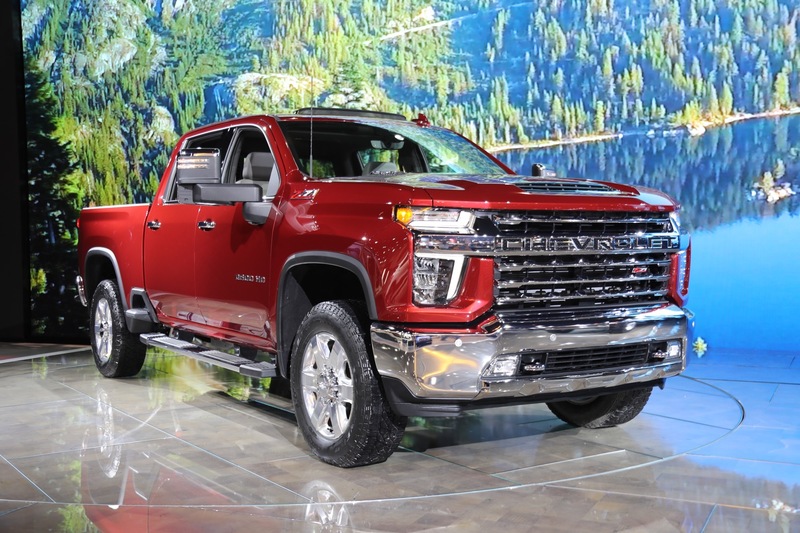 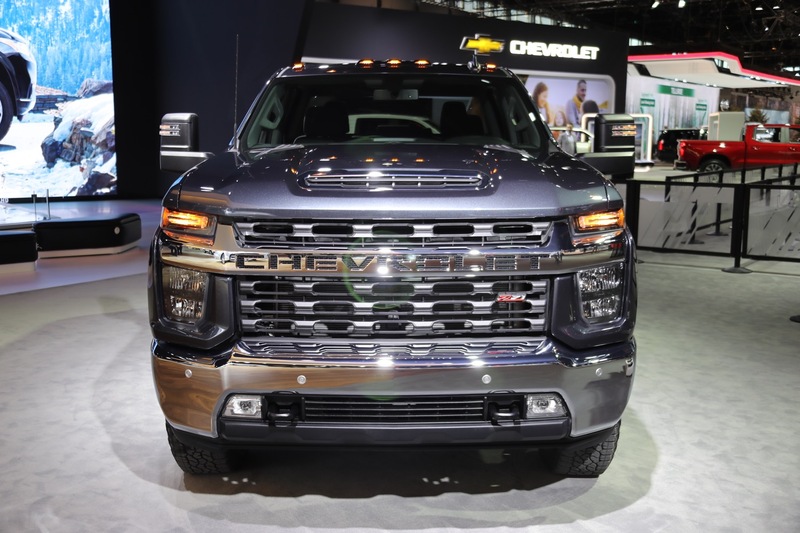 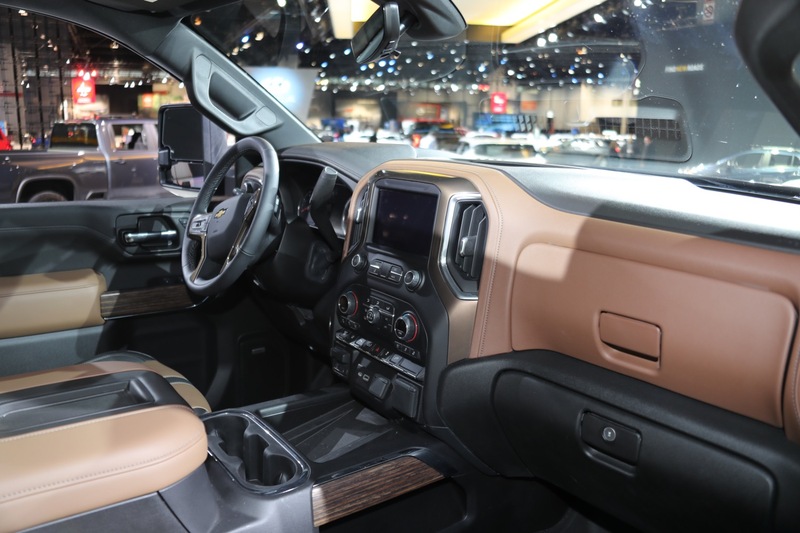 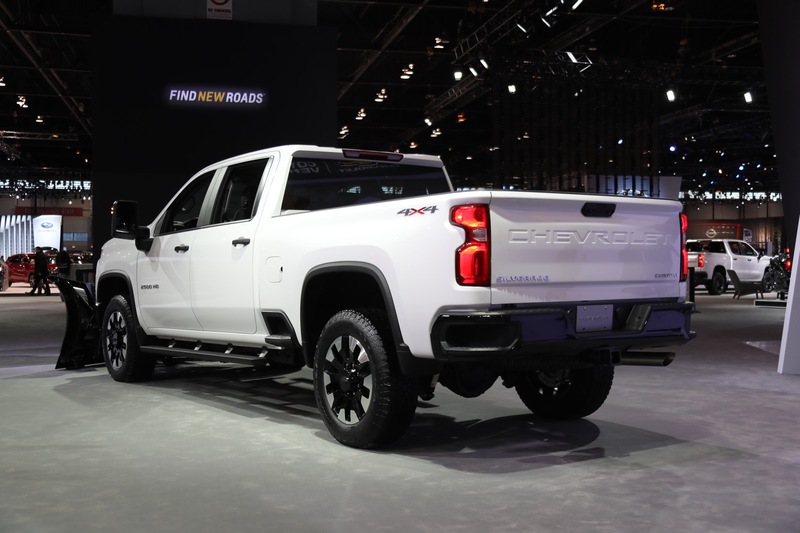 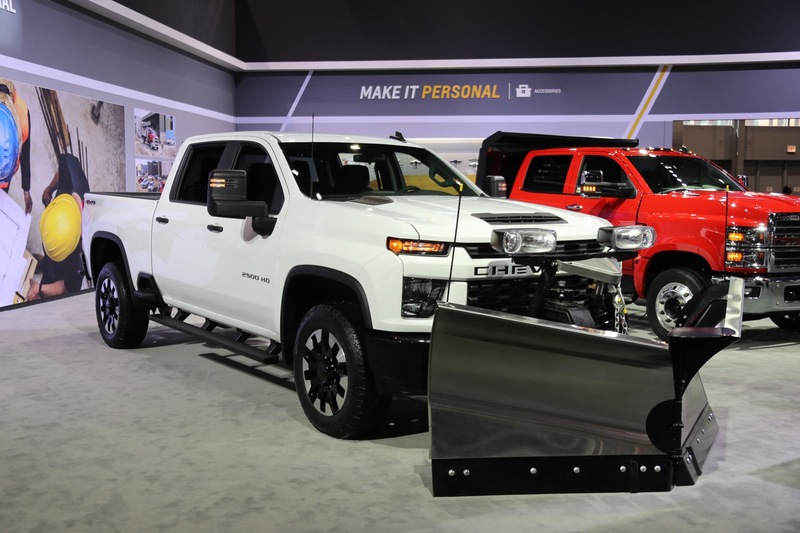 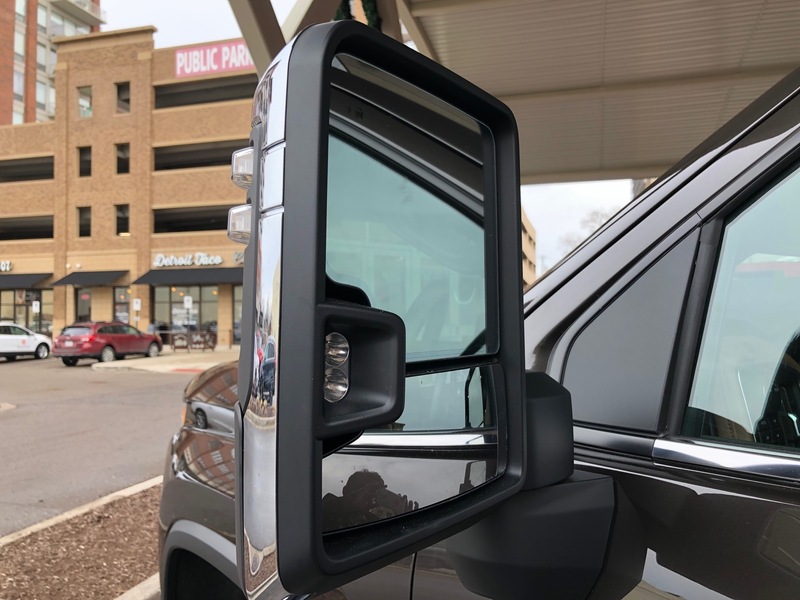 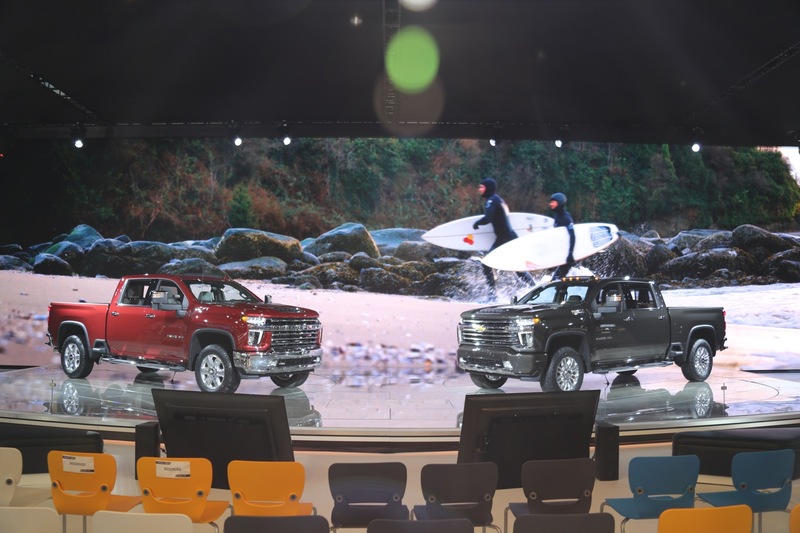 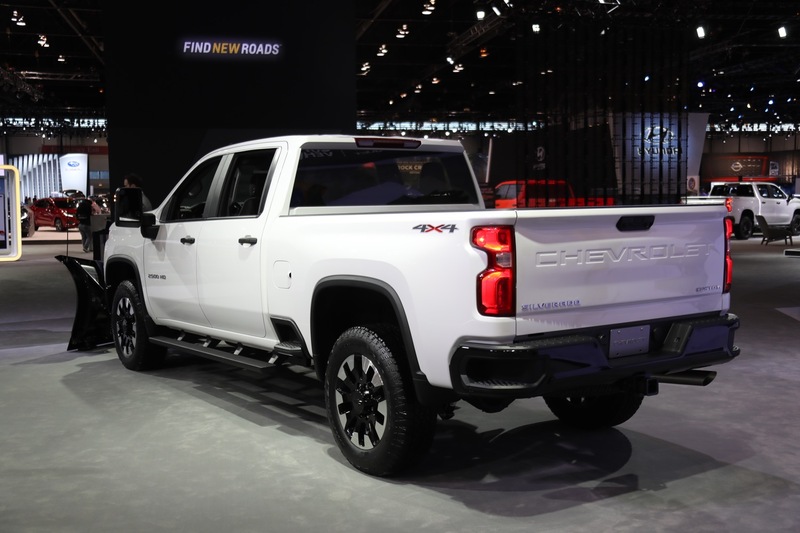 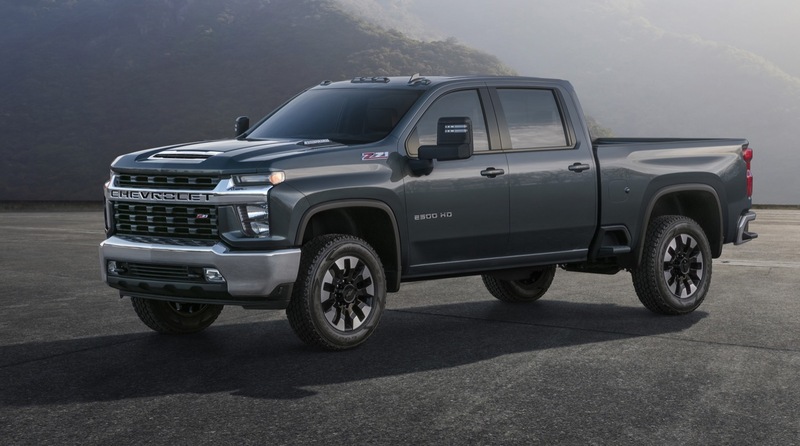 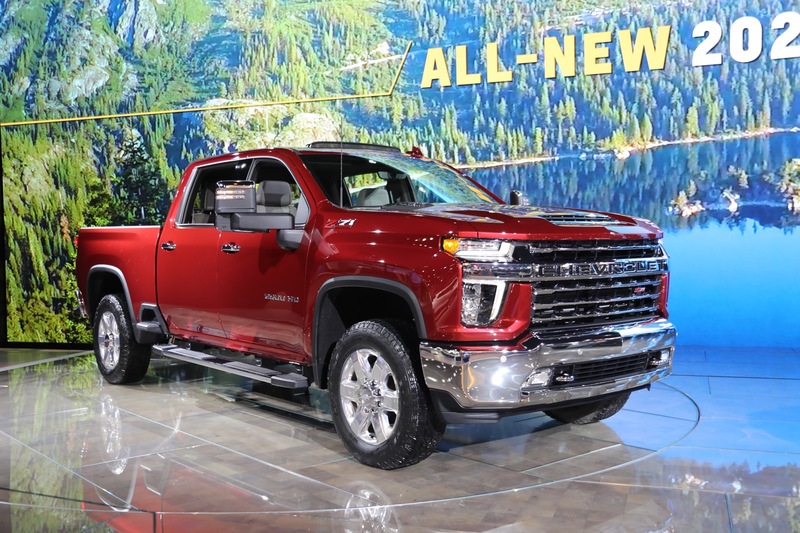 Other notable elements include the wheel wells – which, like the 2019 Silverado 1500 – are no longer squared off. 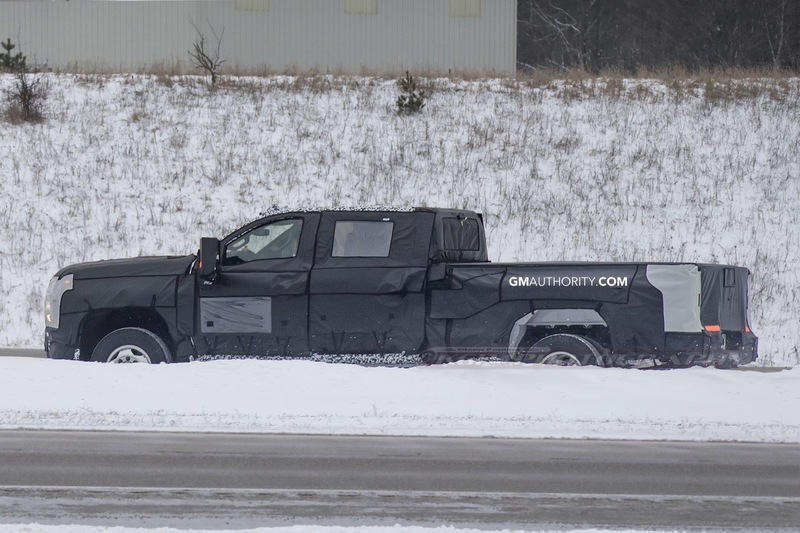 In addition, the cab now appears to have a more upright shape. 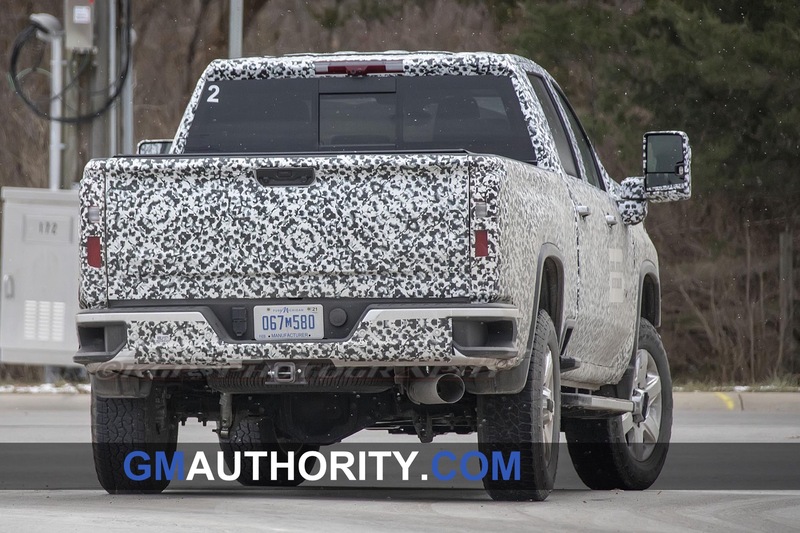 Expect the 2020 Silverado HD to be revealed and launched sometime in the 2019 calendar year. 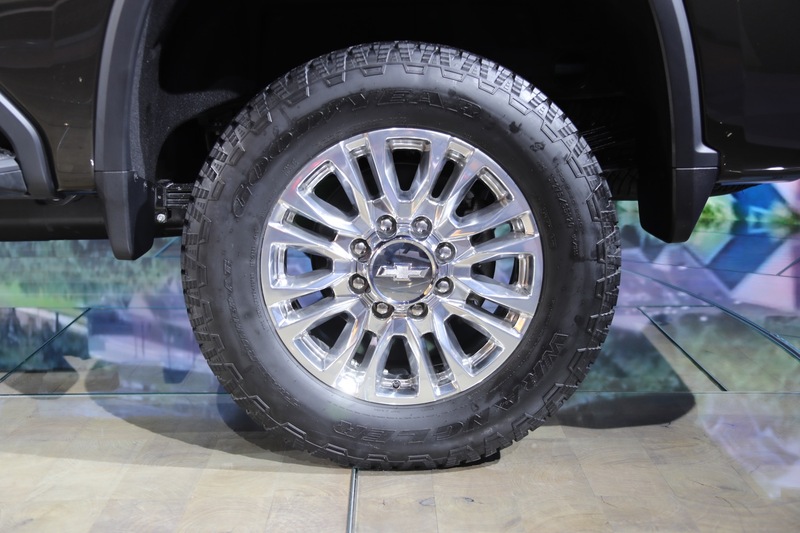 Squared off wheel wells slightly more round than the k2xx wells, glad to see differentiation from the 1500s. 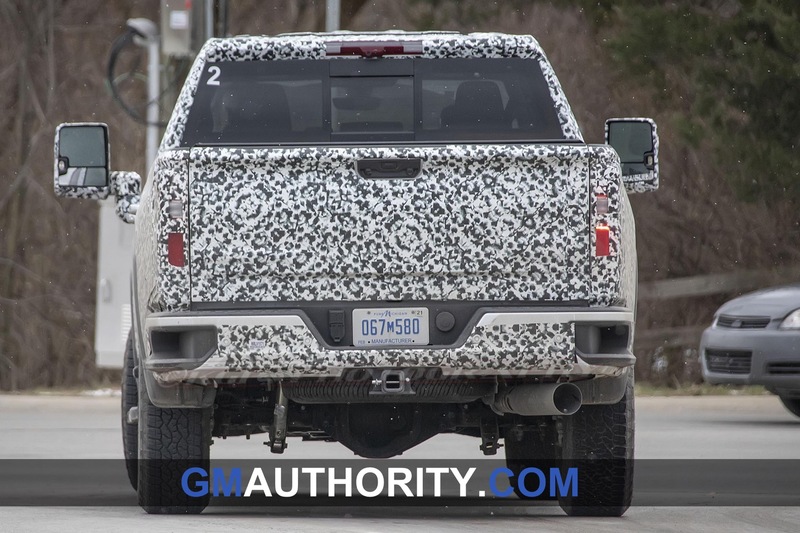 Can’t wait to hear about the new HD gas engine. 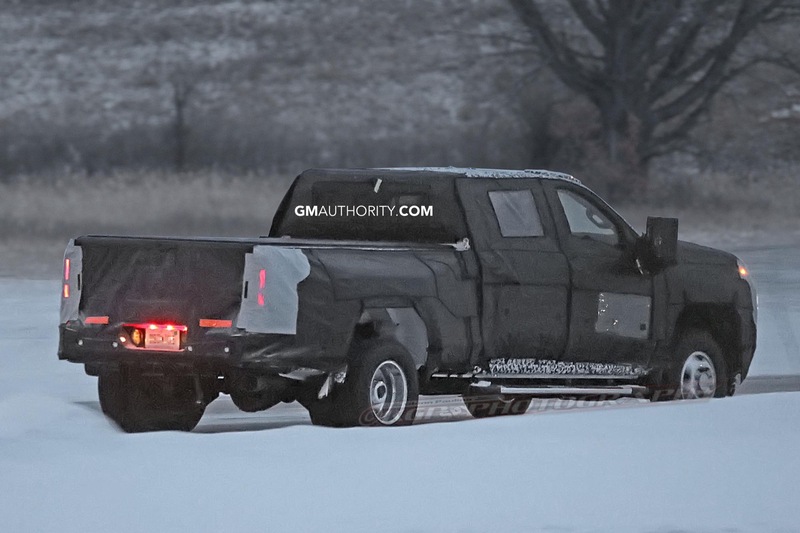 Plastic around the wheel wells like the Sierra?? 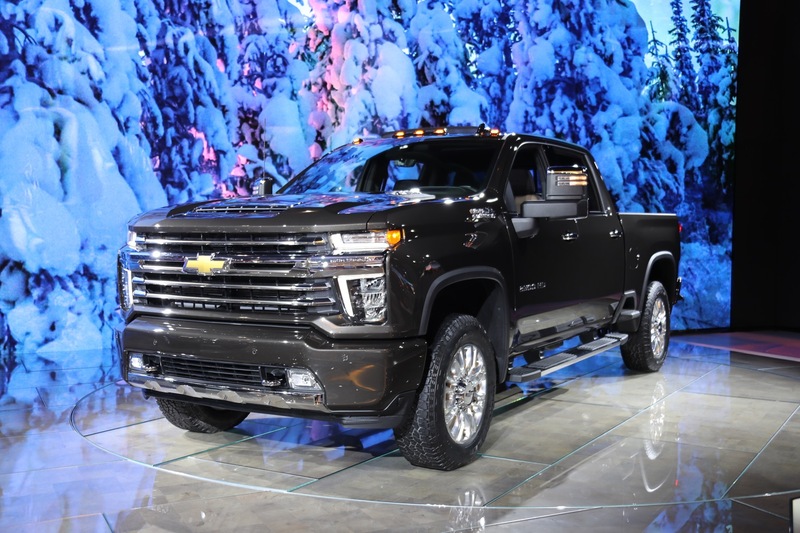 Or maybe this is the Sierra? 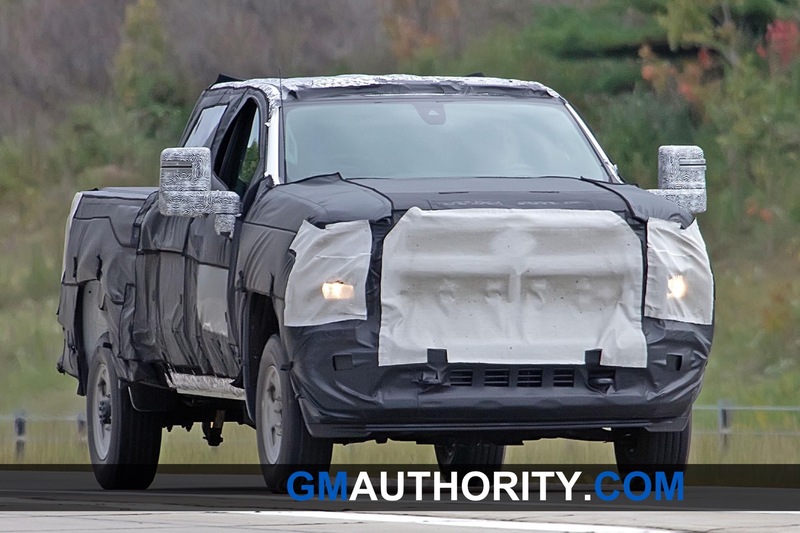 Doesn’t look like it from what you can see of the headlights. 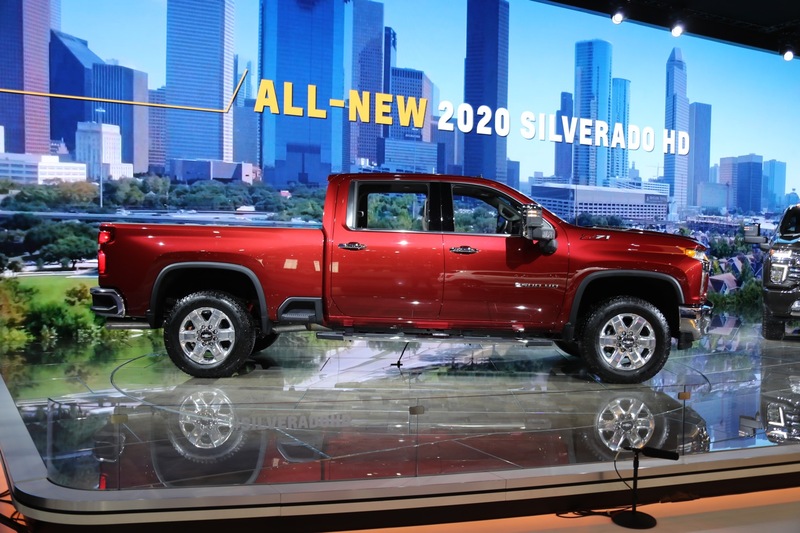 Not a big fan of that if they did go with the plastic like the Sierra. 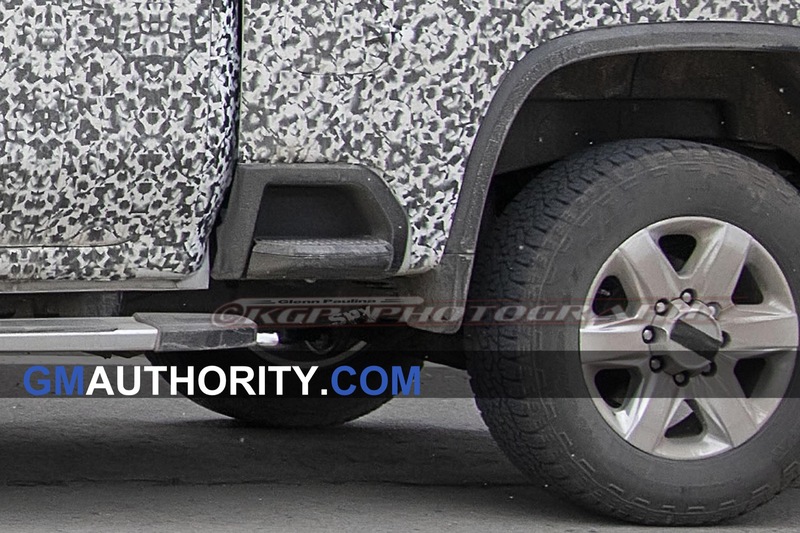 The steps in front of the rear wheels look terrible hopefully that is an option. 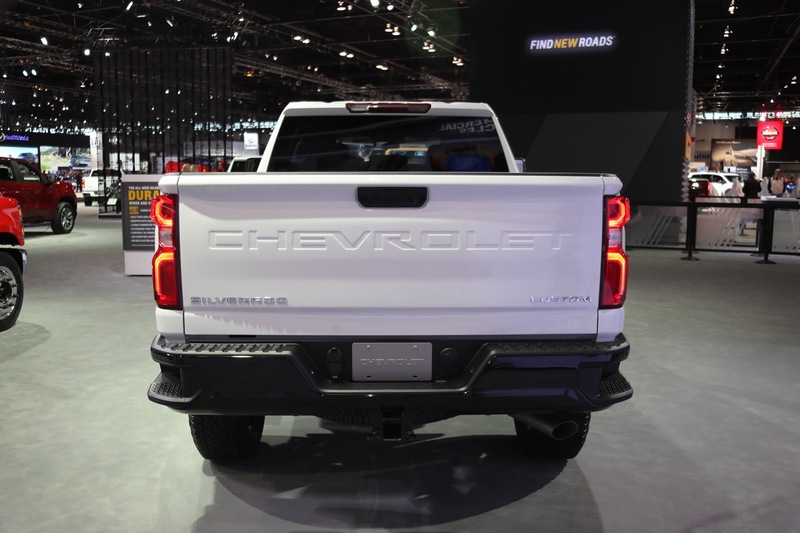 Those steps are gonna be huge and will be accepted, much like the rear bumper cutouts… so many complained about how they look terrible and whatnot… now, they’re not at all a problem. 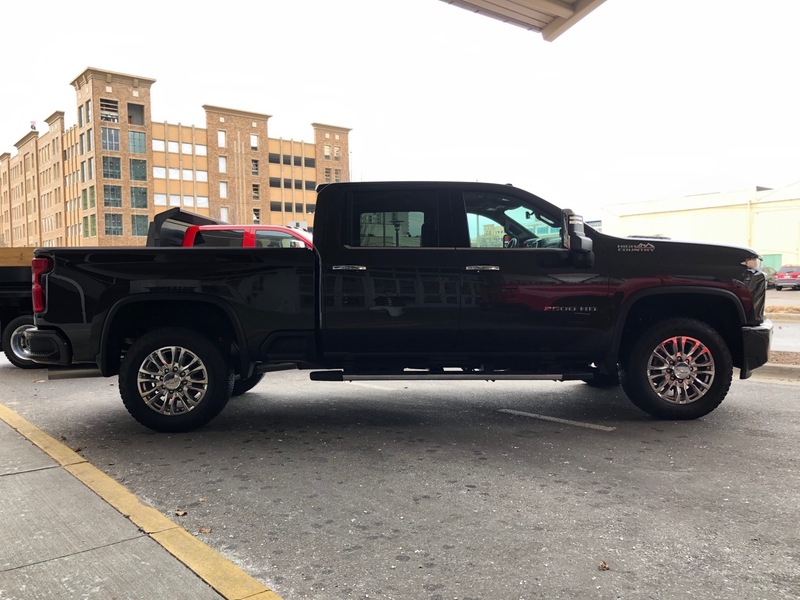 Alex, you are probably right about the steps. 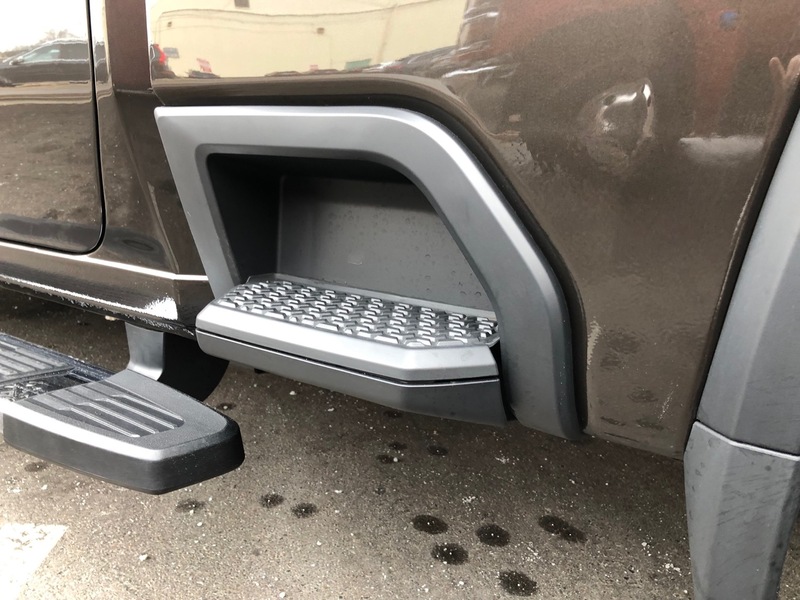 I was not a fan of the bumper steps and now I do not mind them and are quite useful. 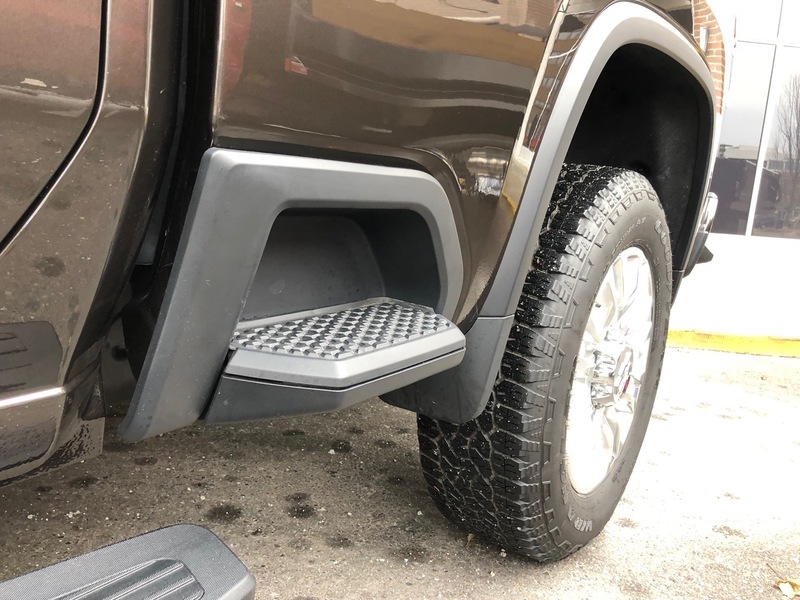 I’m sure the same will happen with the new steps, they just seem like an eyesore to me as of now. 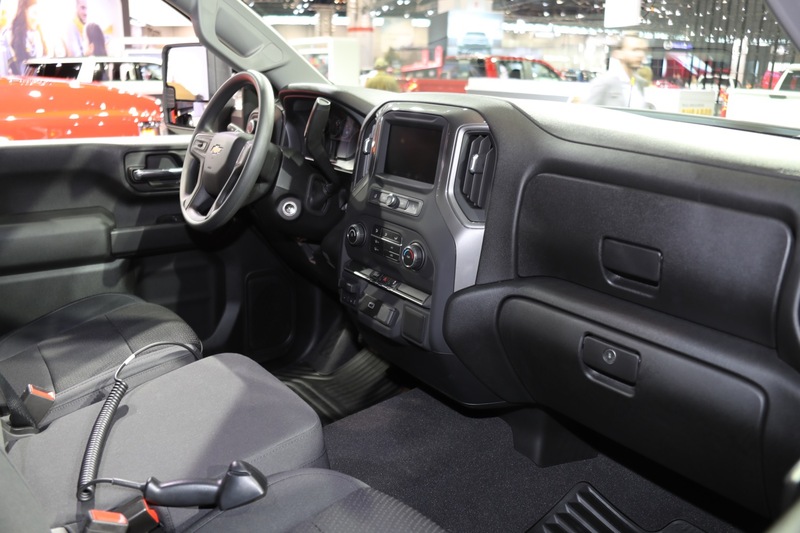 As others mentioned liking the wells compared to the 1500s just hope you are right about the plastic trim. 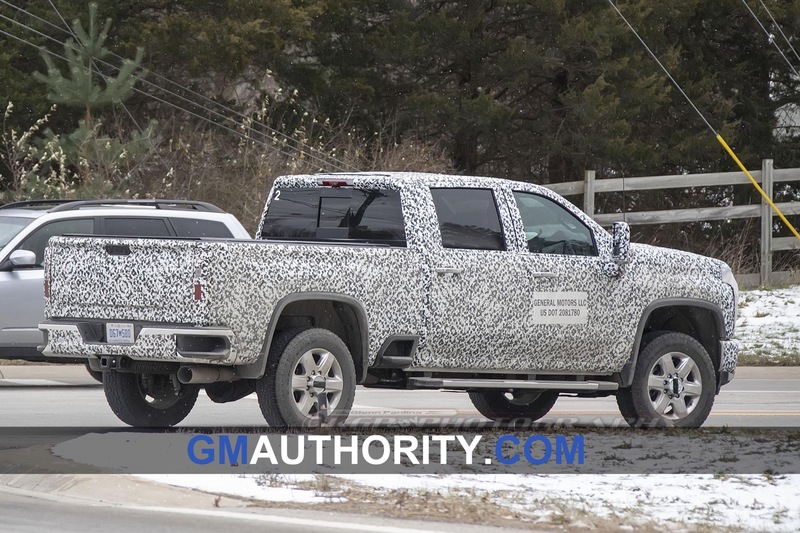 Other than that truck looks great been holding out on a new truck until the redesign HDs are released. 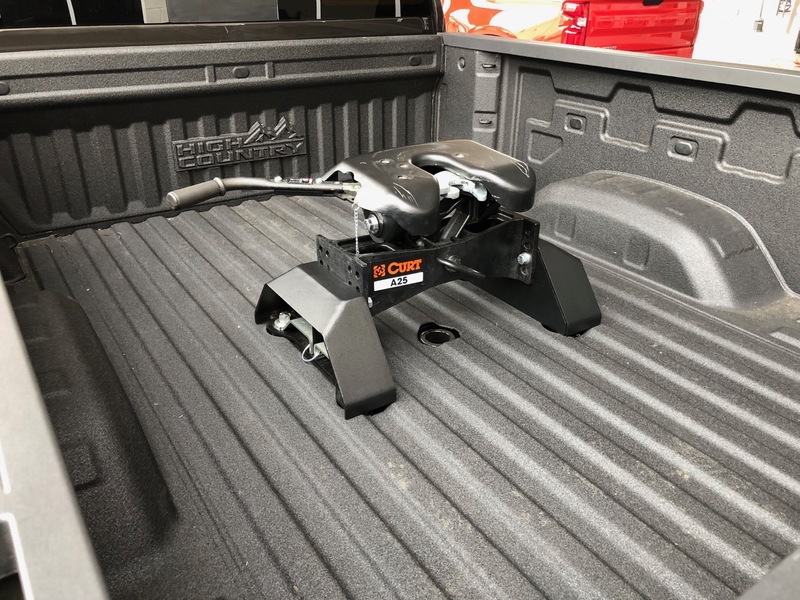 I’ve had my 18 for 4 weeks and I’ve already used the steps to get into the bed about 6 times. 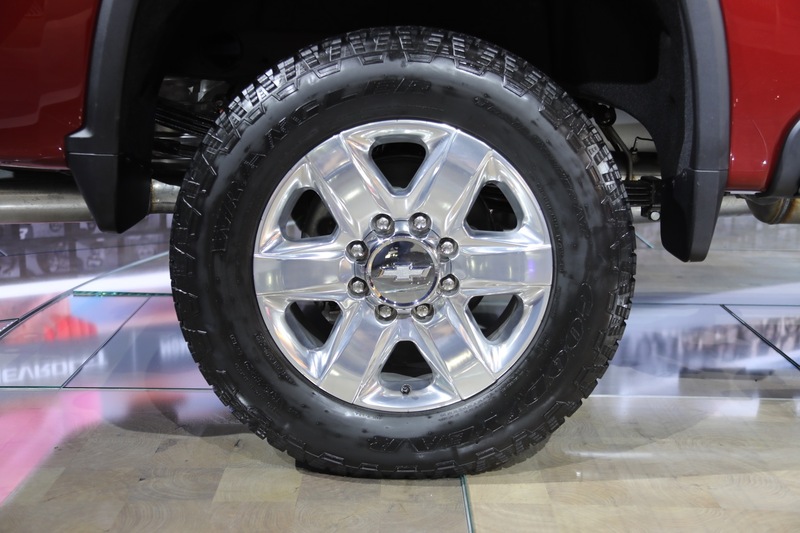 They’re incredibly useful. 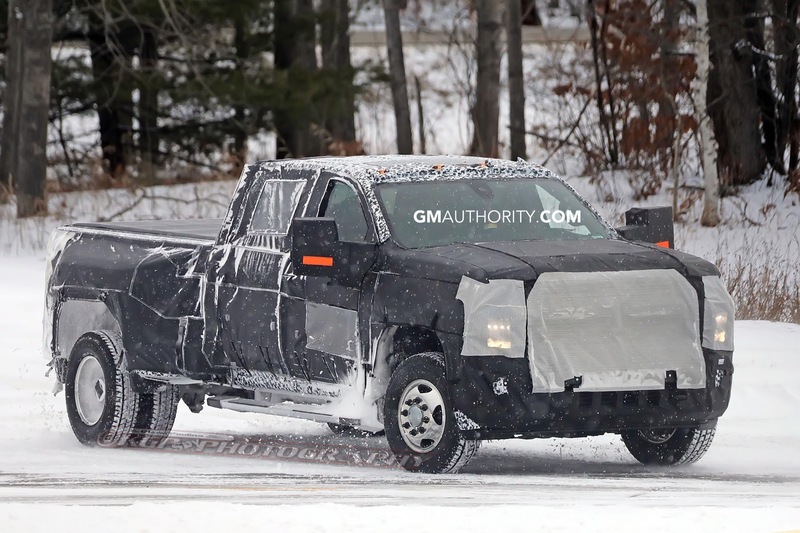 I like how they have differentiated the HD models from the 1500 models, also as the article states I like the upright overall look of the cab/truck kind of how the fords are right now it’s gives it a nice clean look. 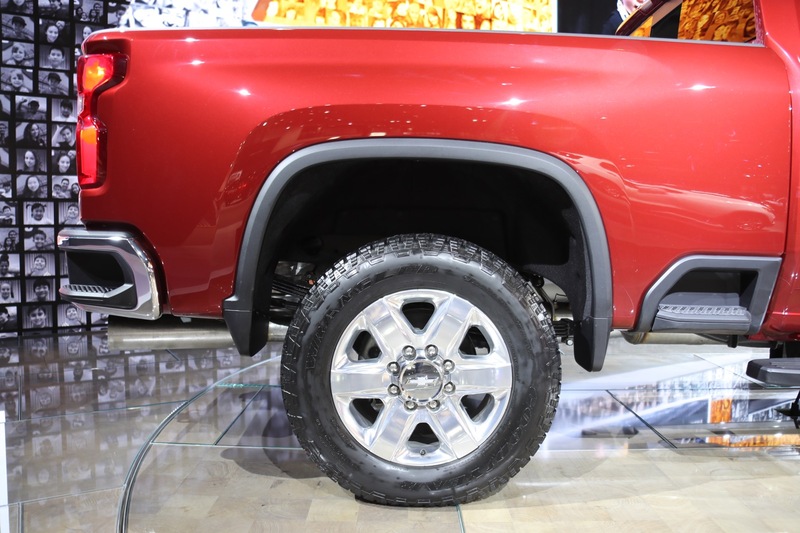 I actually prefer the wheel well shape of the 1500’s myself. 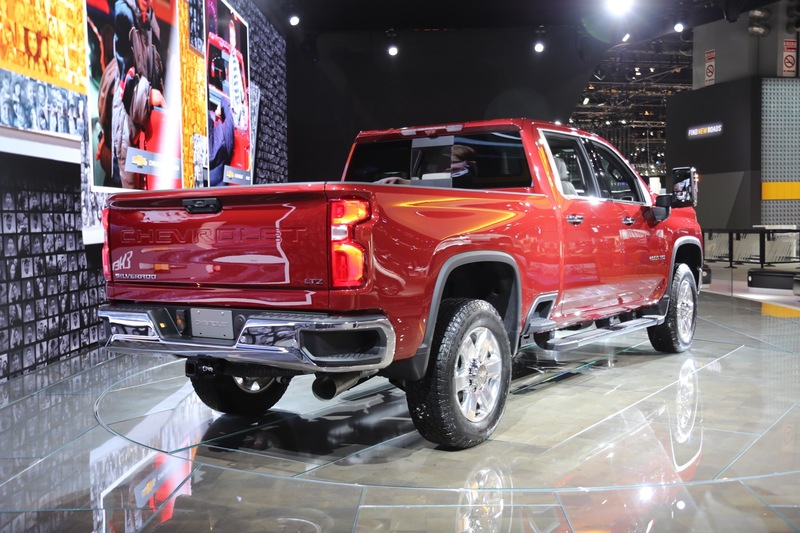 IMO Chevy nailed it. 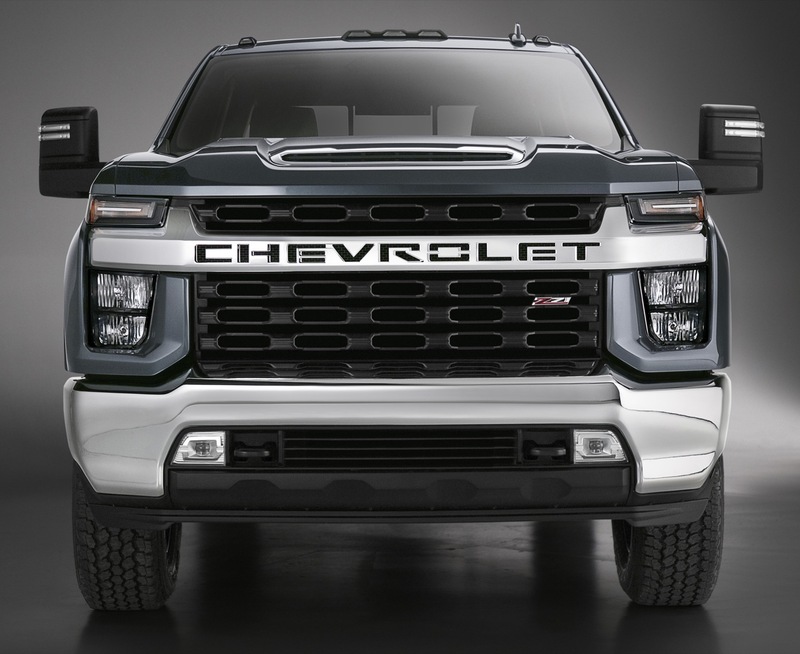 I’m burned out on the square look and think the 1500’s is perfect as it’s not a complete perfect circle design either like what Ford has. 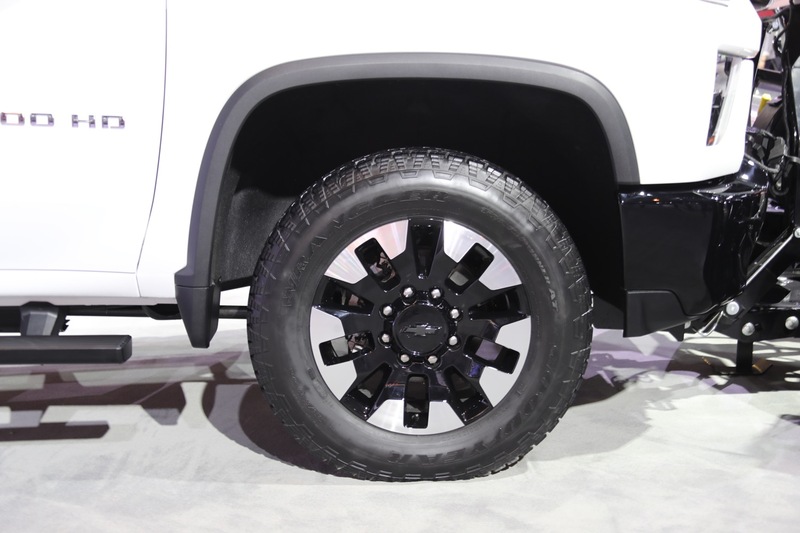 However, I love the full front bumper, plastic wheel well protection and upright cab. 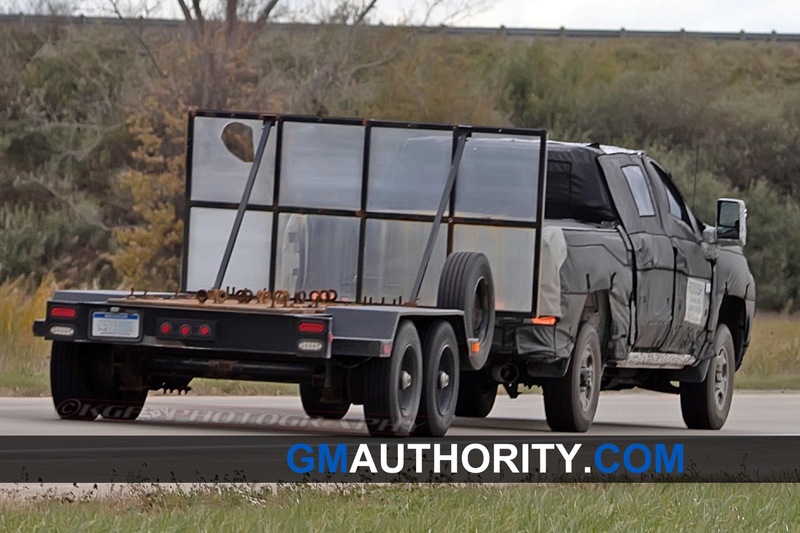 I wish those things were on the 1500’s. 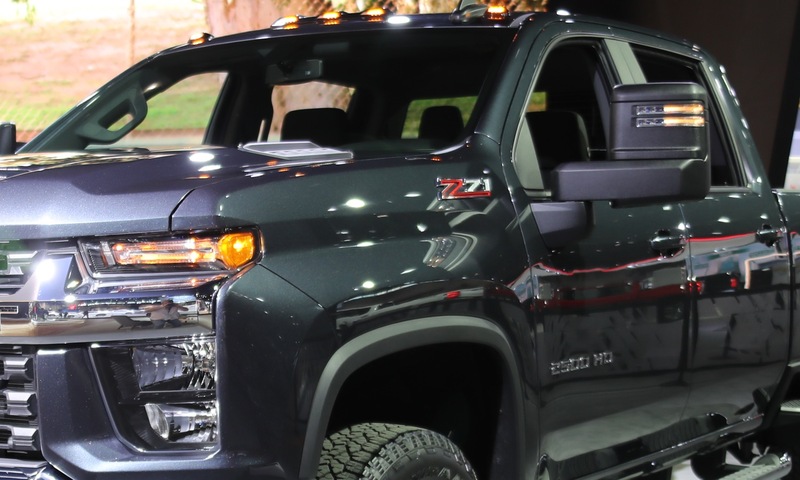 It would have made the perfect truck for me. 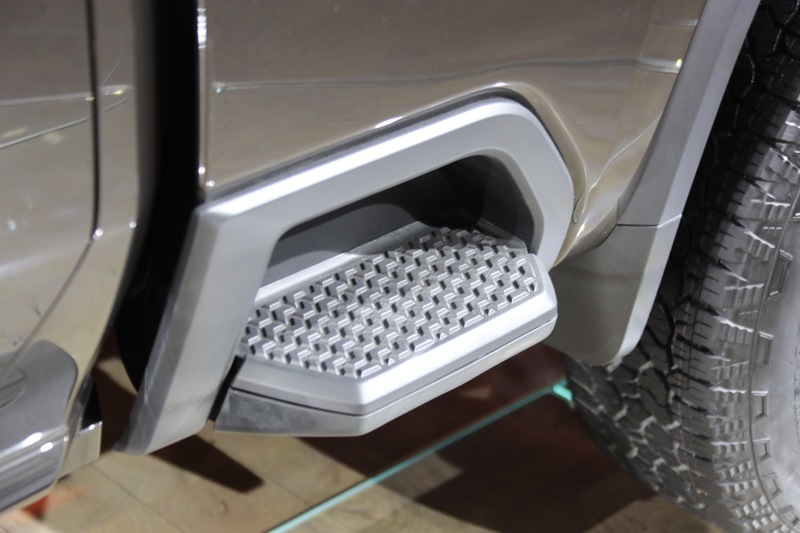 I also think the side step is a great idea for the HD’s. 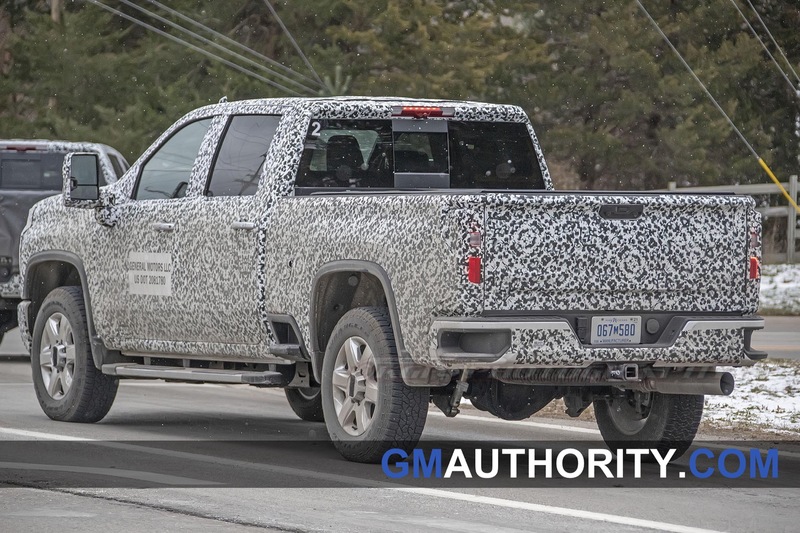 I do have to wonder if there will be a SFA option now that GM is building their own axles again? 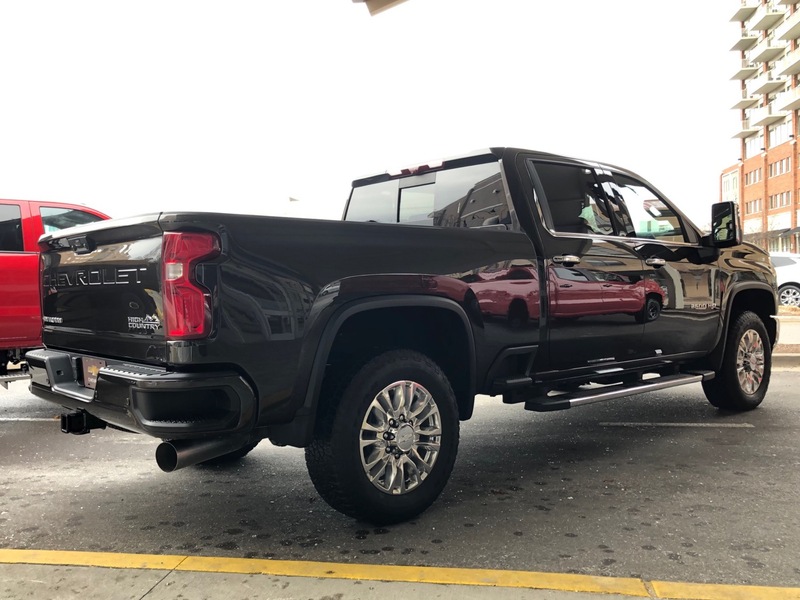 Plastic notches in the bumper looked crappy since the Avalanche, and plastic steps in the side of the bed aren’t any better! 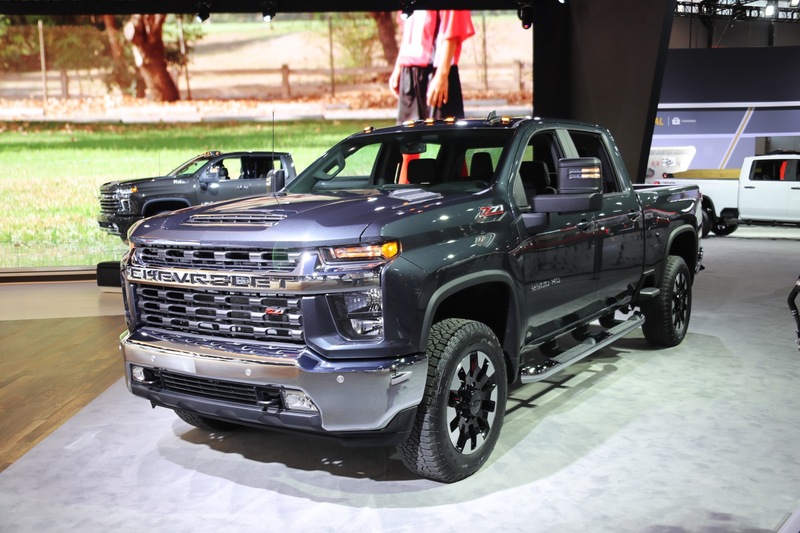 I understand this is the USA gene pool and while trucks are getting taller, the average truck buyer is getting fatter and shorter, but let’s not throw aesthetics to the wind. 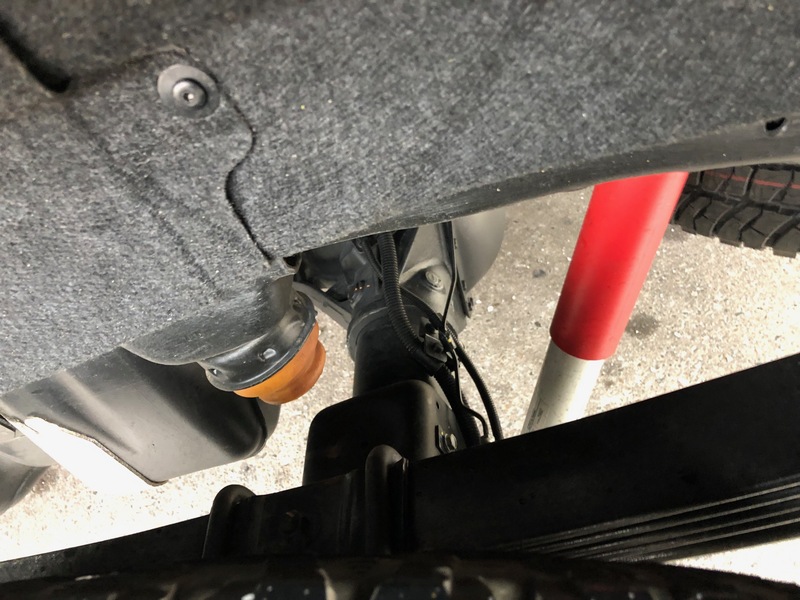 Its amazing how people pick out the most insignificant things to complain about. 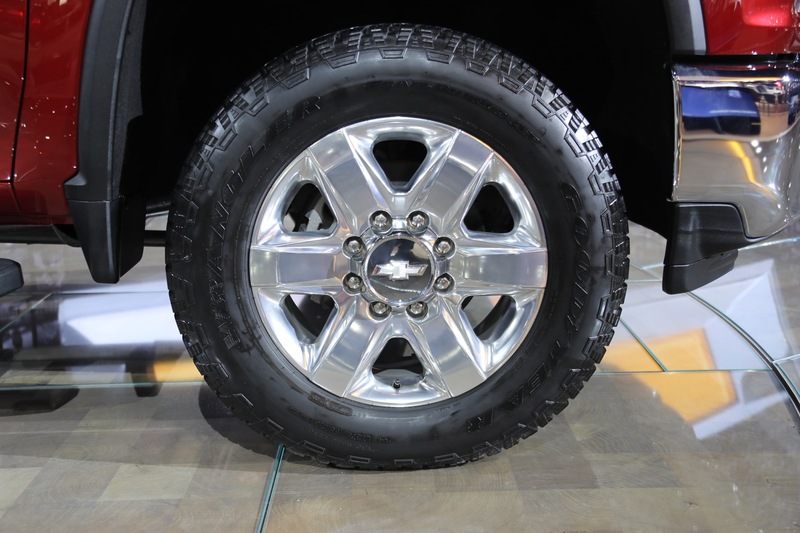 Plastic wheel well covers and the step in front of the wheel! 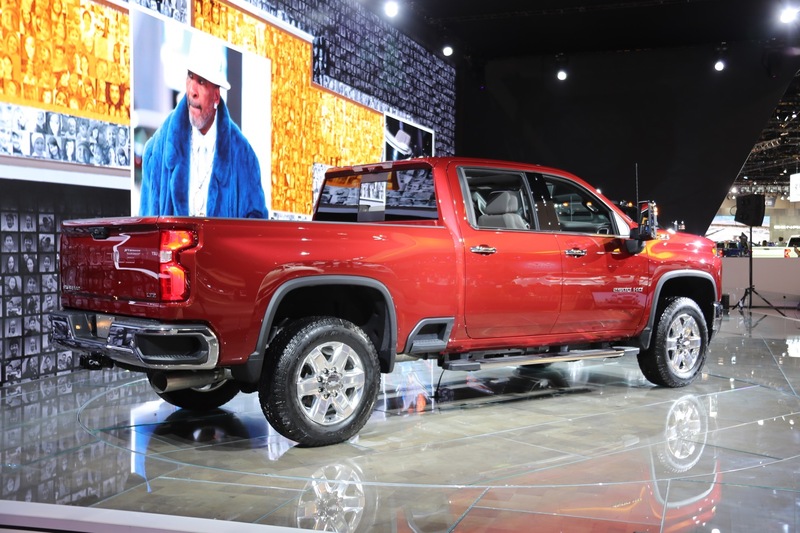 There is no way those things can keep a person from buying one of these trucks! 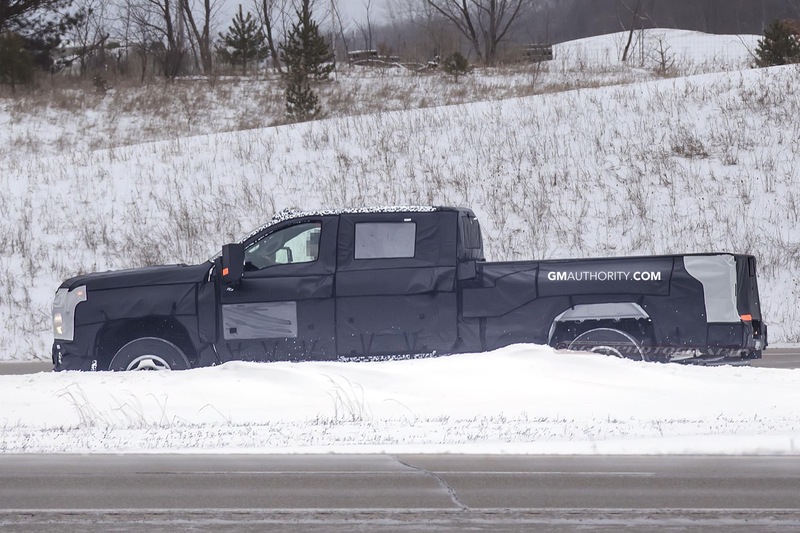 I agree with Matt. 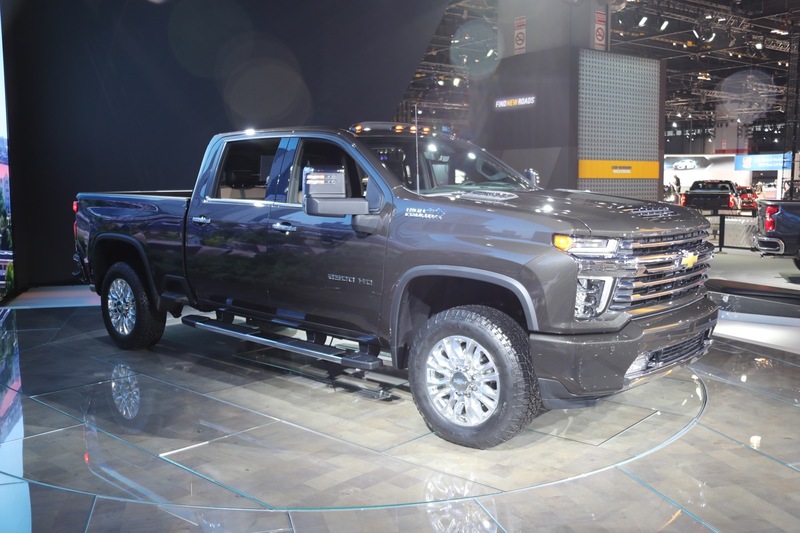 Just maybe, maybe, GM will offer a solid axle option. 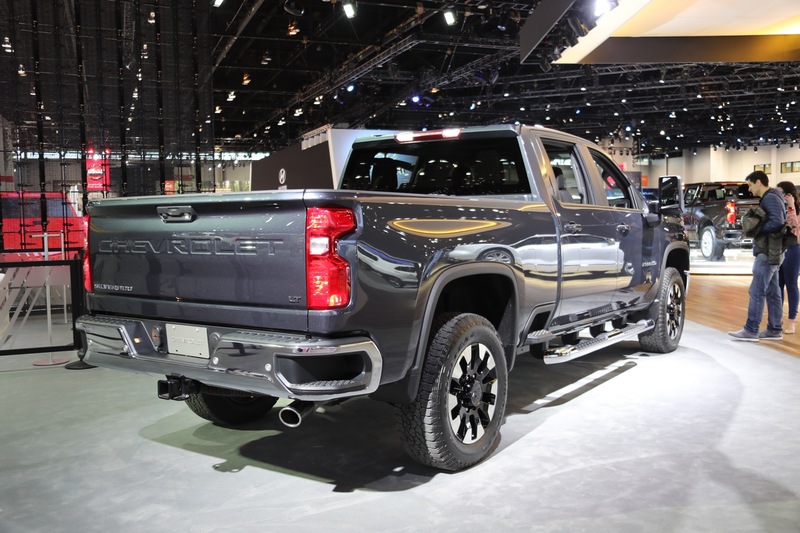 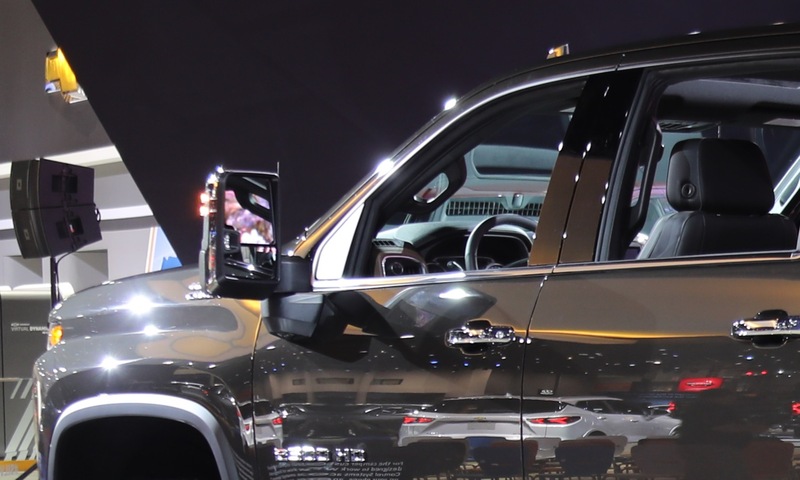 Ram and Ford are killing GM withe their solid axle trucks. 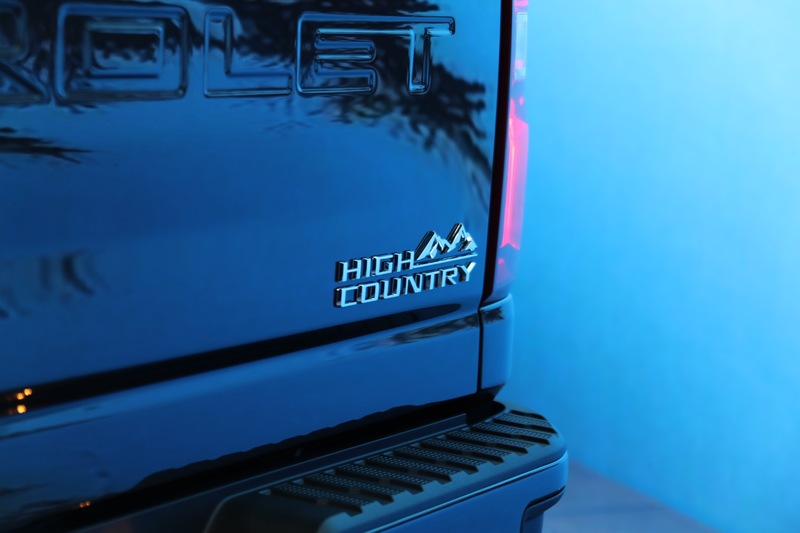 We have been waiting since 1991, for the HD trucks to have that option again. 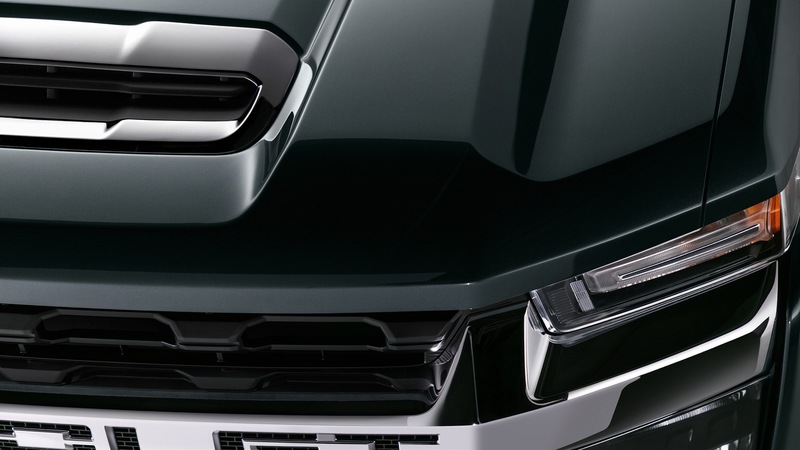 Still have ny ’91 1 ton. 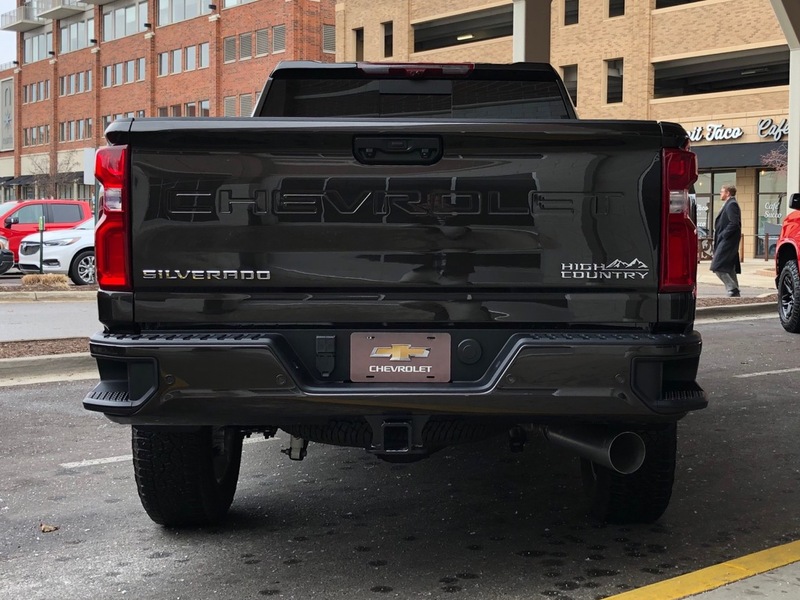 It just can’t be beat. 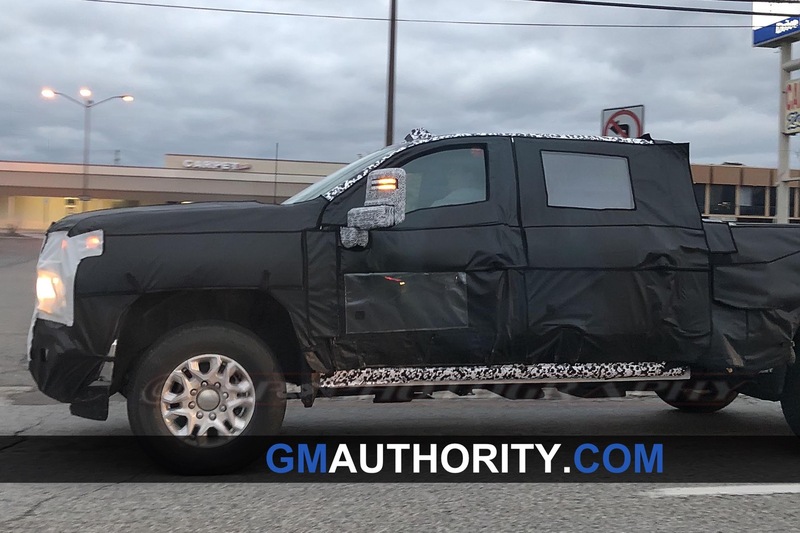 We can only hope!!!!! 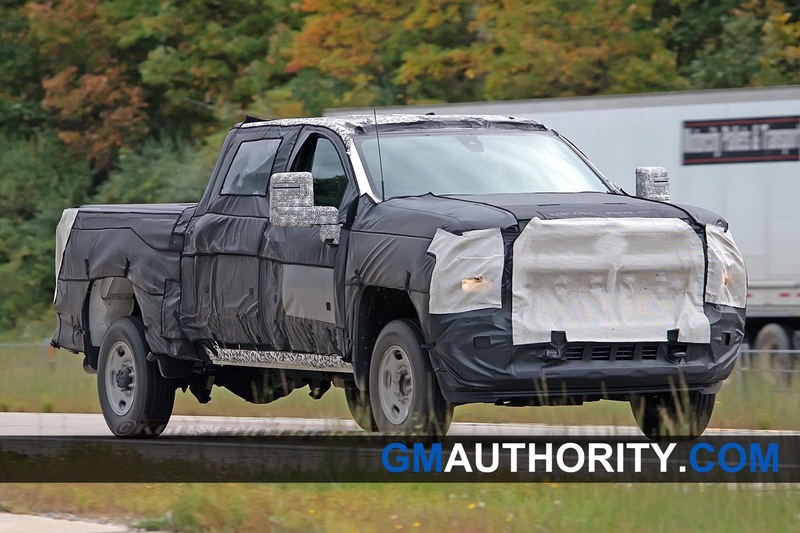 These trucks are being tested with IFS and torsion bars. 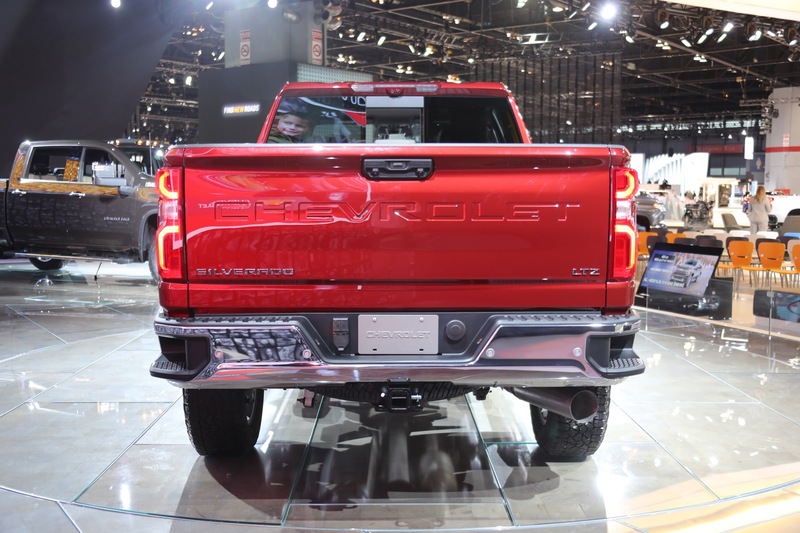 At least if they would of ditch the torsion bars in favor of coil overs and have airbag option, that would be a good welcome. 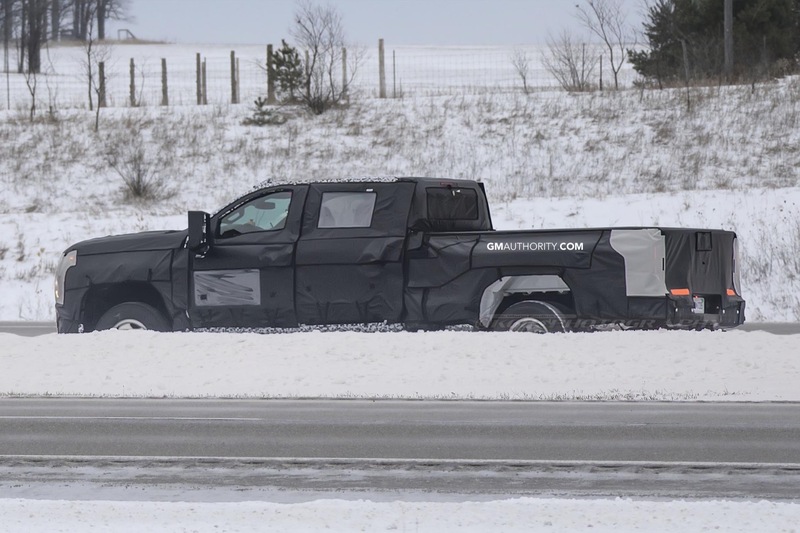 I think the chance is very small, likely cause the new medium duty trucks offer this. 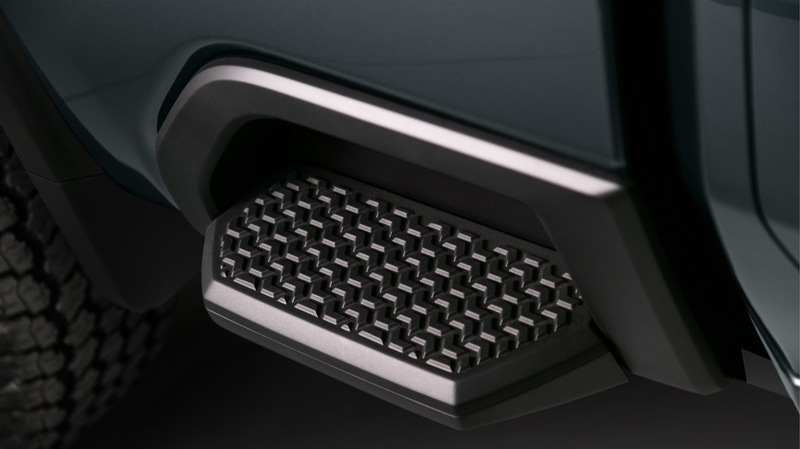 That said, it should be an option for fleets/off-road reasons. 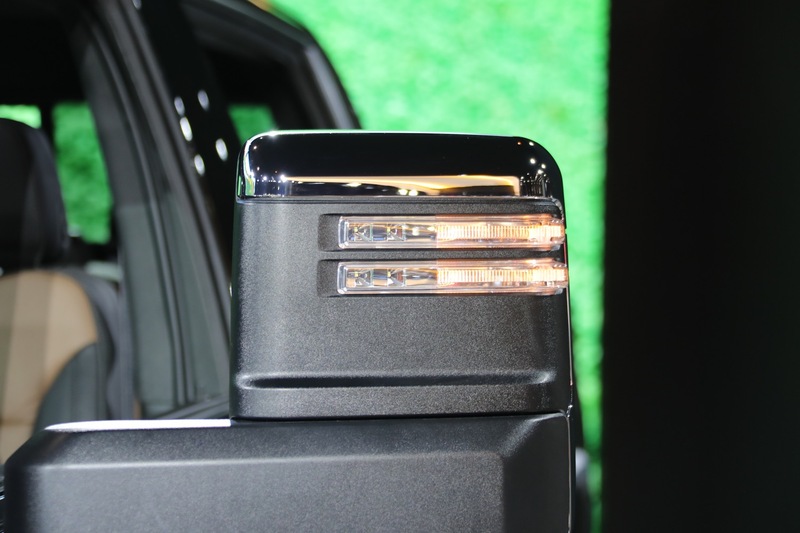 the air curtains aren’t integrated into the bumper anymore, but if you look at the headlight shot closely, they’re still there.